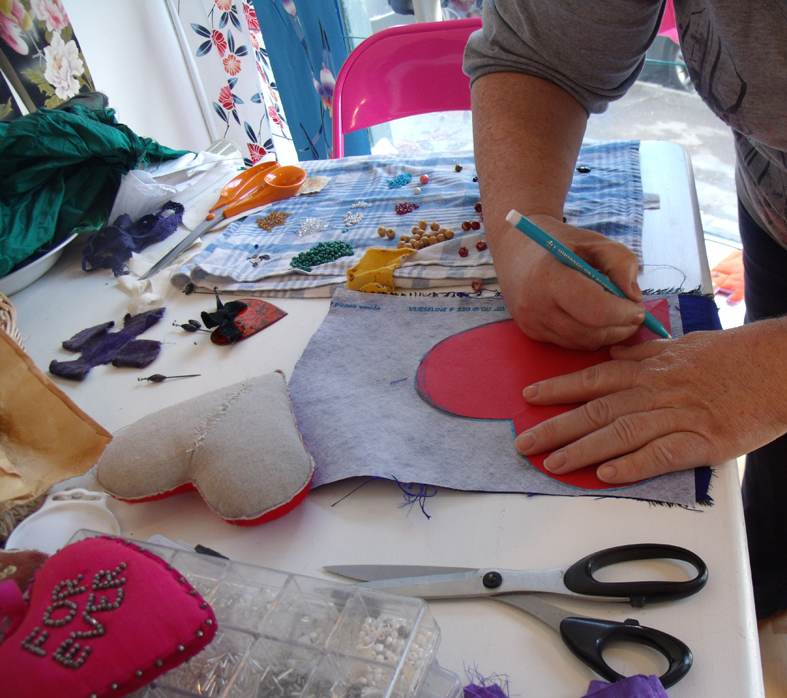 On Saturday, 11 May 2013 the Event ” Coffee, Cake and Stitch happened! 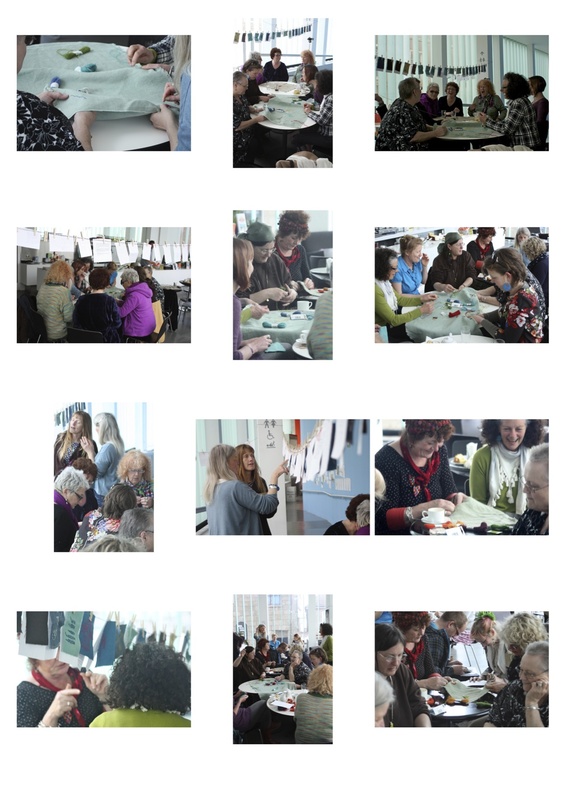 From 15.00 till 17.00 pm 14 people came to the cafe of the Exchange Gallery Cafe and joined me for some time of stitching and sharing stories. Bill, who very brilliantly documented the event with photography and film, observed, that there was an ebb and flow of phases of chatting and concentrated stitching. 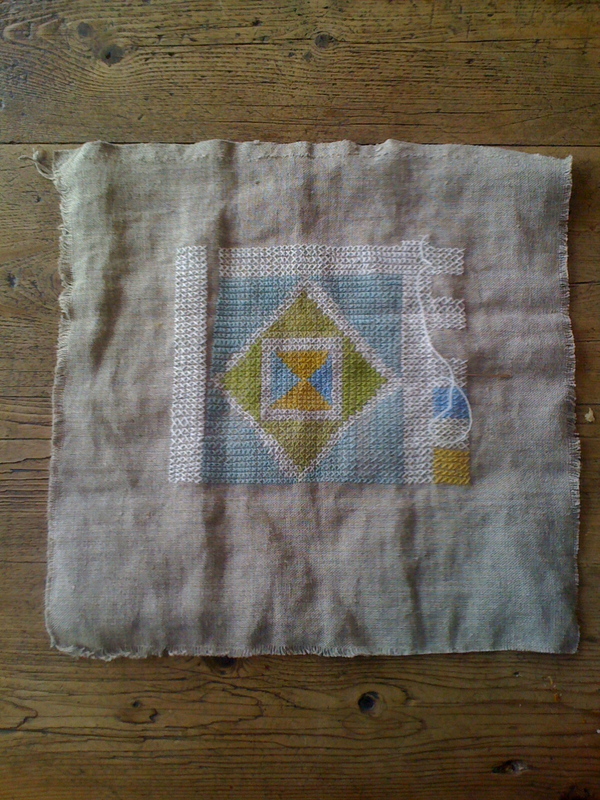 People looked very closely at “washing line” of the Stitch Samplers, which were on display. And were quite fascinated by the amount of writing in the comments. 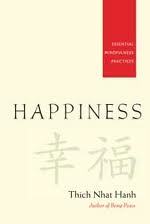 It was observed that there had appeared a common thread in the comments about, moments of stillness, relaxation and enjoyment. 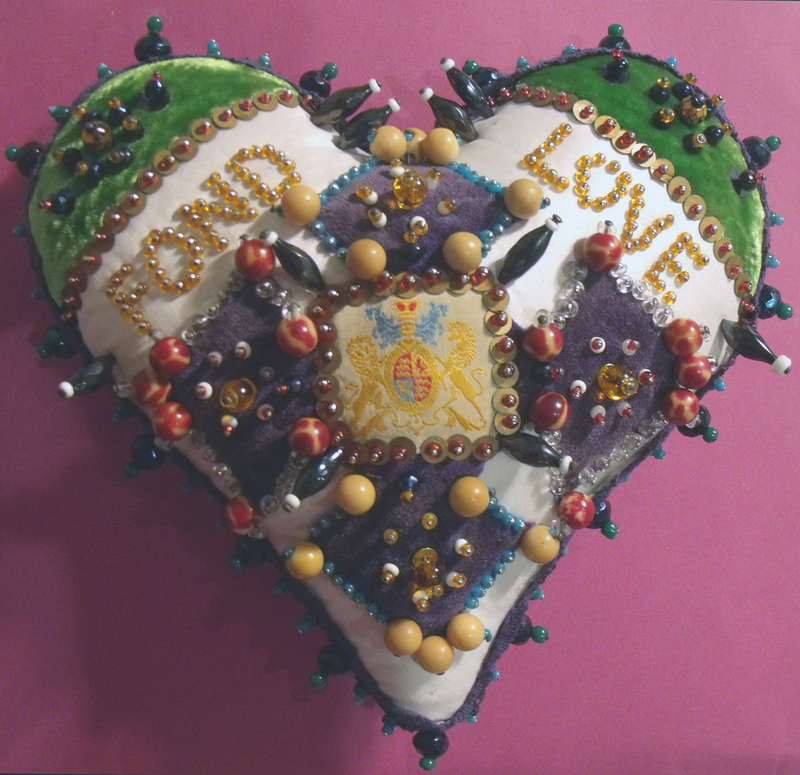 They picked up on the notion that “Make do and Mend” has changed from its stigma of poverty to being worthwhile. 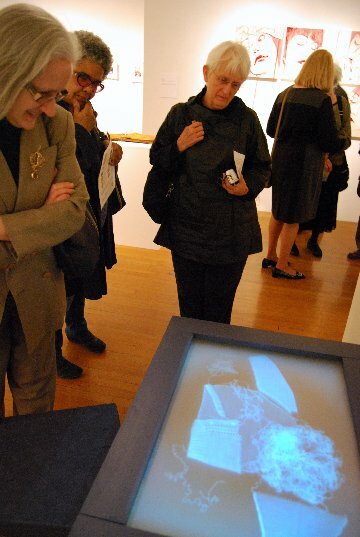 The exhibition ‘Mending at the Museum’ has finally been launched at The Bristol City Museum and Art Gallery – and it runs until April 2013….which sounds simple enough but it is the culmination of at least 3 years collaborative practice based research between academics and professional makers and artists. The ‘Stitching and Thinking’ research group, which I facilitated in my post as a senior research fellow, evolved the exhibition via a series of mixed media workshops, visits to the museum’s mended collections, many meetings, discussions, conference papers and a small sample-stage exhibition; and it also caps off my academic career which started in 1973 and finished last year in 2011….. So no pressure then. 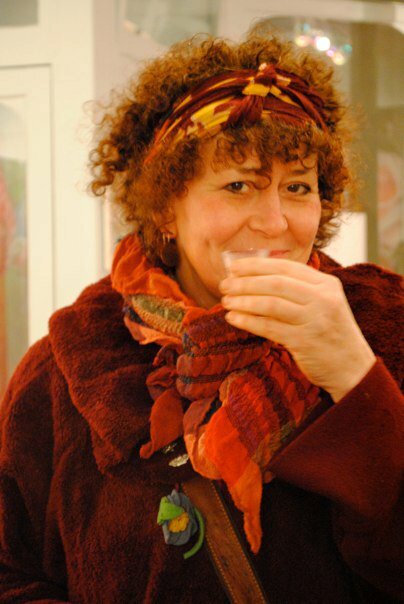 I co-curated the exhibition with Dawn Mason, currently the award leader of Drawing and Applied Arts at U.W.E. 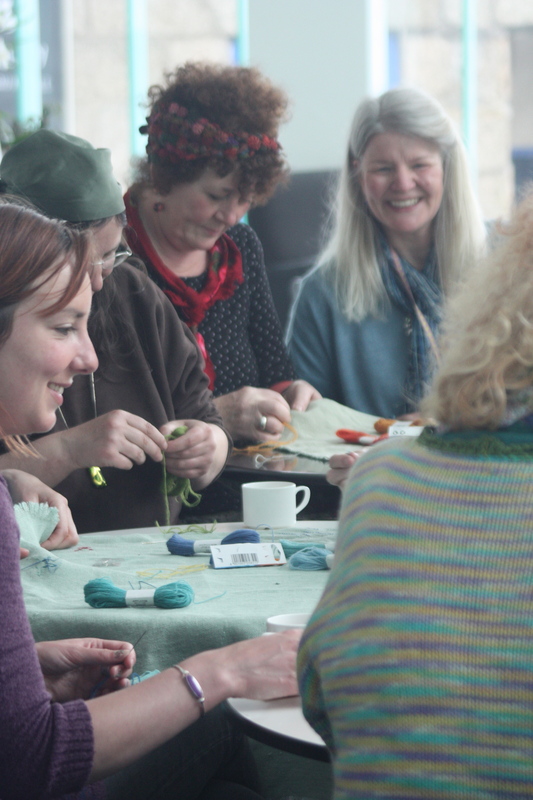 Bristol, and my long-term academic colleague and collaborator in all things stitched. 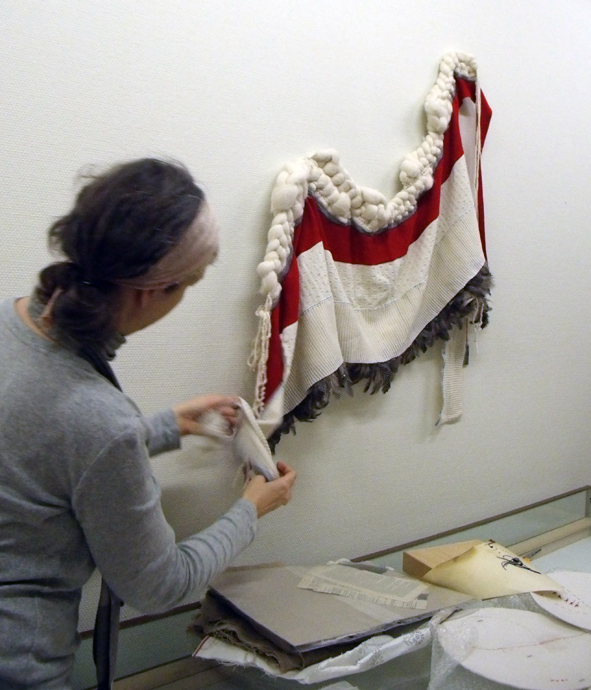 In the museum we worked with Karin Walton, the Curator of Applied Arts at Bristol Museum, and who holds the secrets and the keys to the museum’s sampler collection, the mending samplers were the main inspiration for the work that has finally been exhibited. When I arrived on the first morning to hang the work, Dawn and Karin had already placed the exhibits, still in their wrappings, on the floor below the wall space allotted to them, but there were piles of extraneous pieces, scattered over tables and chairs, it became my task to sort these out. The idea of the exhibition is partly to show how ideas evolve during the making process – Dawn and I have written and spoken many times of the necessity of makers to have time for reflection; making work worthy of contemplation requires as much time for the thinking as it does for the making process. It is a constant making and thinking about what you made, re-making, re-thinking until somehow the pieces resolve themselves and you wonder how they could ever have become anything other than what they are. Each exhibitor was responsible for physically putting their own work on the wall, this saves so much argument later….but with only 7 exhibitors who know one another well we each respected one another’s’ space – well most of the time. So during the next 2 days each member of the group came and sorted their own work out meanwhile just looking at all the unwrapped pieces was really fascinating as work seen only at the sample stage 4 weeks before, now appeared ready for the wall. Work can made or marred by the way it is hung and also what it is hung next to. We were all acutely aware of how the whole exhibition must work together. 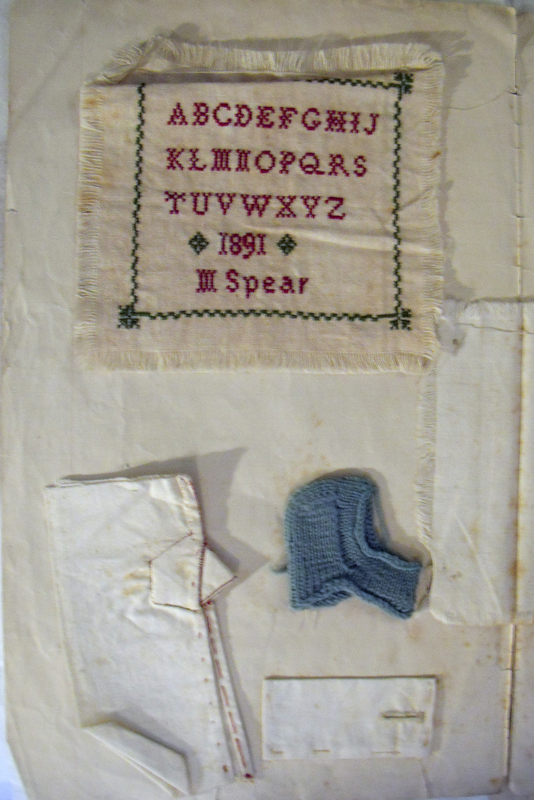 It comprises 3 different elements; some of the museum’s mending samplers, our own samplers of work made throughout the research period, and the pieces made specially for exhibition. 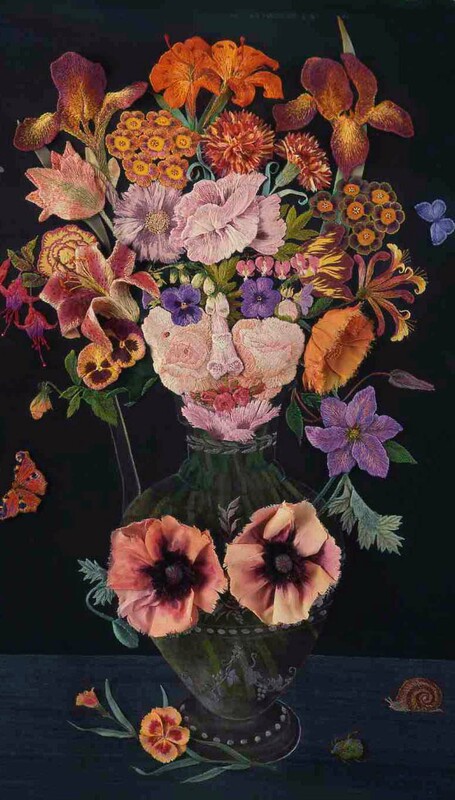 Steph Wooster’s knitted and pieced work looked different when it was stretched over some embroidery hoops that acted almost as magnifying mirrors – drawing the eye to the details of her messages. She writes of museums being ‘houses of high culture; they show the best of us’. 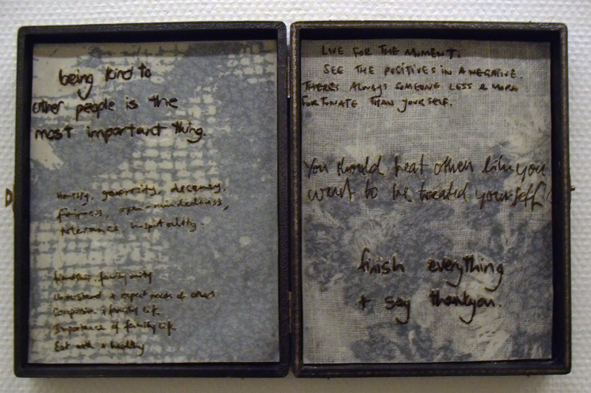 Finding evidence of mending within the museum’s exhibits she delights in glimpses of ‘everyday life’ . 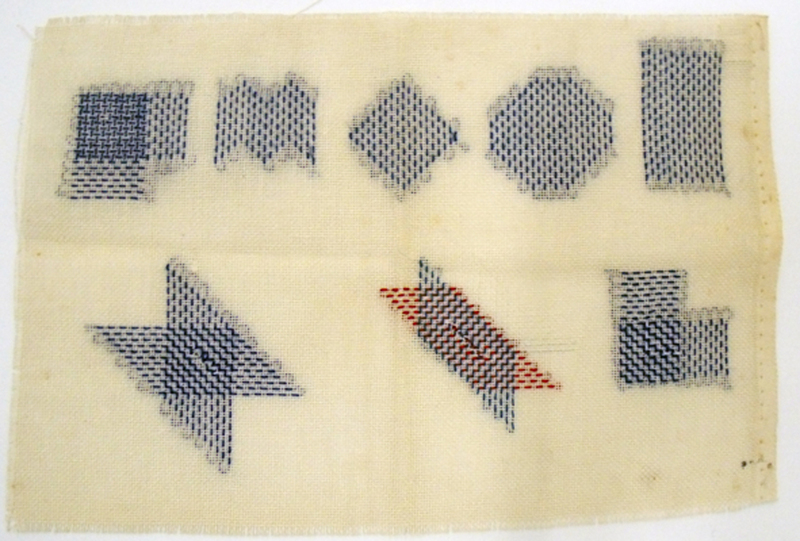 Her work, influenced by the written messages on samplers, ‘celebrates the ordinary’ by using simple fabrics with ubiquitous machine knitting. 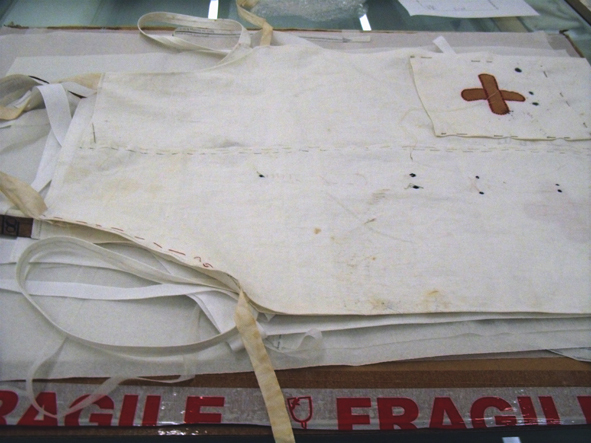 Jilly Morris‘ children’s aprons came neatly laid one on top of the other with a Fragile label printed on the cardboard wrapper – a comment, I felt, not about the fact that the contents could be damaged but of the fragility of what was inside and already ‘ damaged’ . 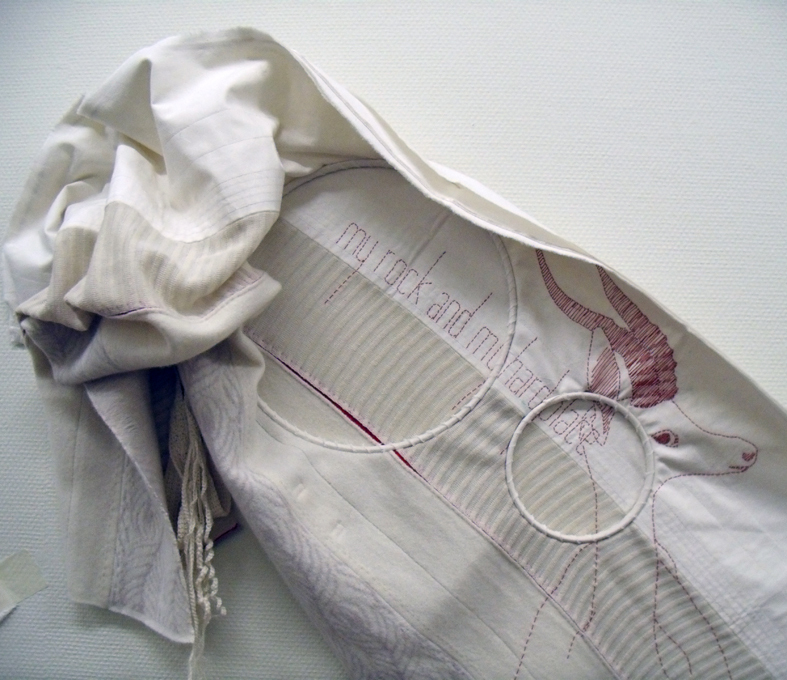 The title of the work produced is ‘Mending Takes Time’ and refers to the functional stitching that was traditionally taught as part of their general education to girls, as transferable skills in an era when fabrics were ‘treated with regard’ and material was frequently mended to preserve a precious commodity – so at odds with our easy access to all types of fabric from all over the world. 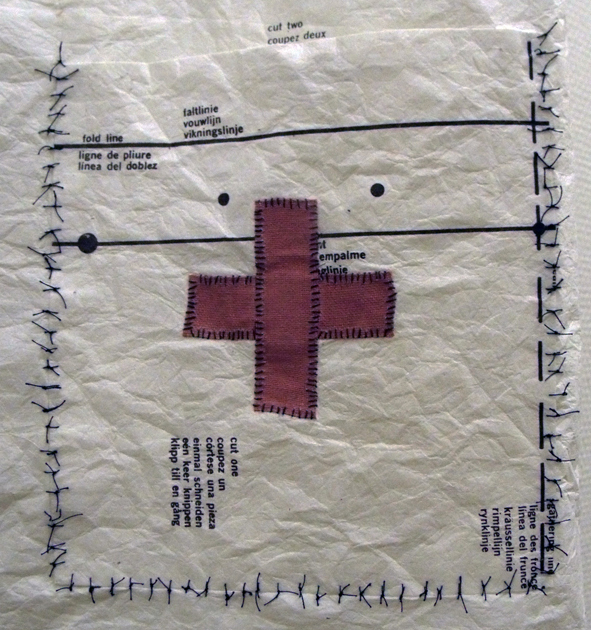 The cross shape made by various commercial medical dressings recall the basic shape of most darns seen on the samplers; when executed in ready-made modern plasters she references the ‘quick fix mentality and disposable culture’ of the present day. 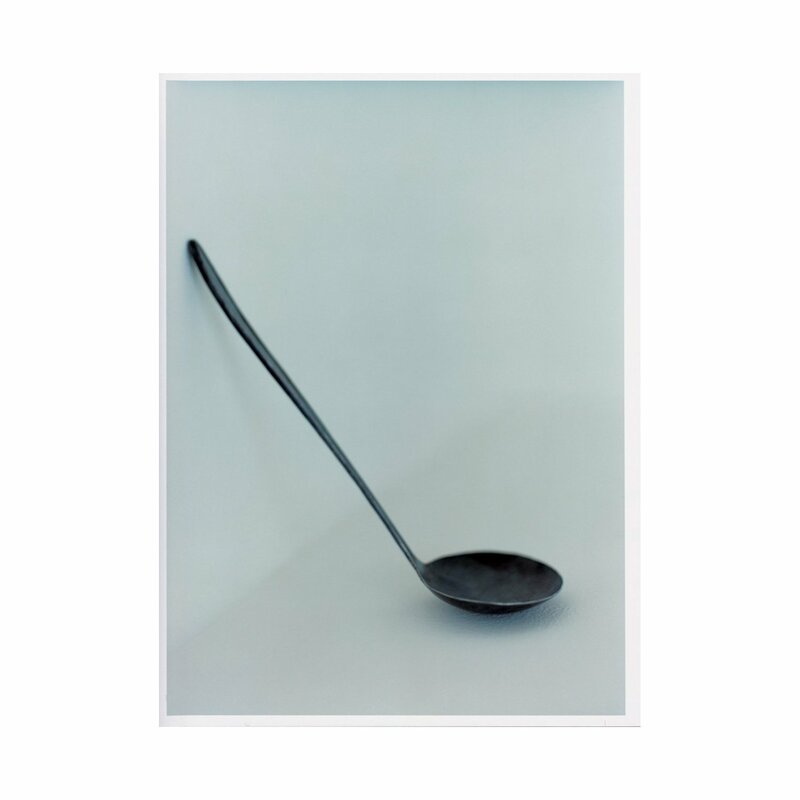 Jess Turrell came in with a box of assorted table-wear cups, saucers and a range of metal components such as spoon bowls, fork tines, knife blades and their specially made handles – which she made up before she placed them in a large vitrine. 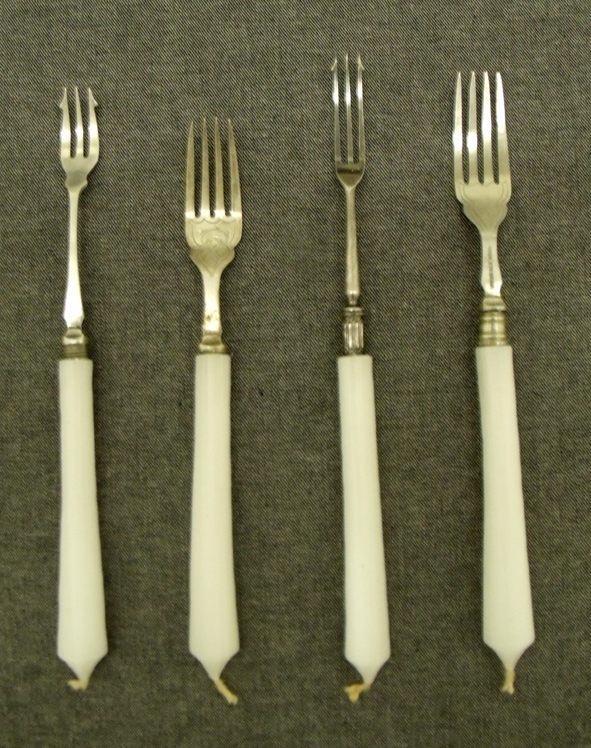 Her work is called “Inappropriate Mendings” and she is having some fun at the idea of making aesthetically elegant mending that is really useless for any practical purposes, fork handles are whittled from wax candles (gedditt?) 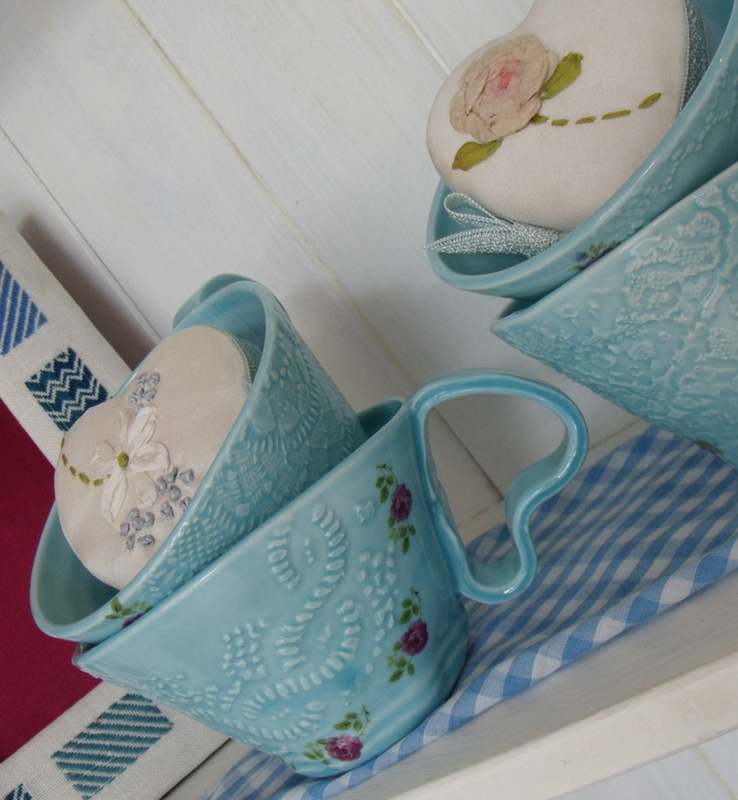 cups are mended with calico, and spoon handles wrapped in plasters from the first aid tin. 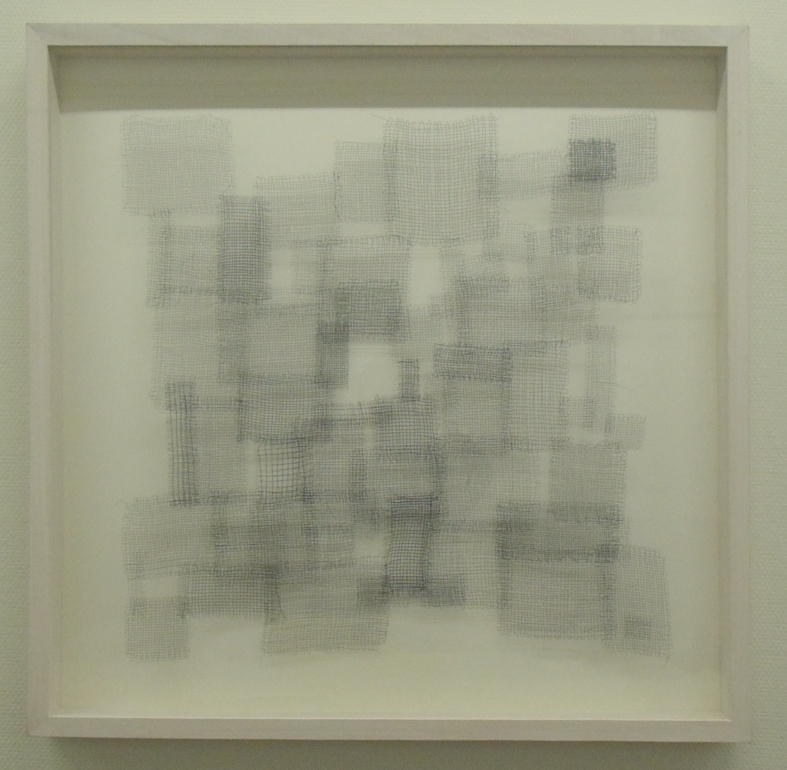 Dail Behennah brought in a fragile darned wire piece, mercifully it was framed and so this was the easiest to hang…the piece is simple and refined and references a particular black darning sampler in the collection, which is placed in a vitrine opposite her work. 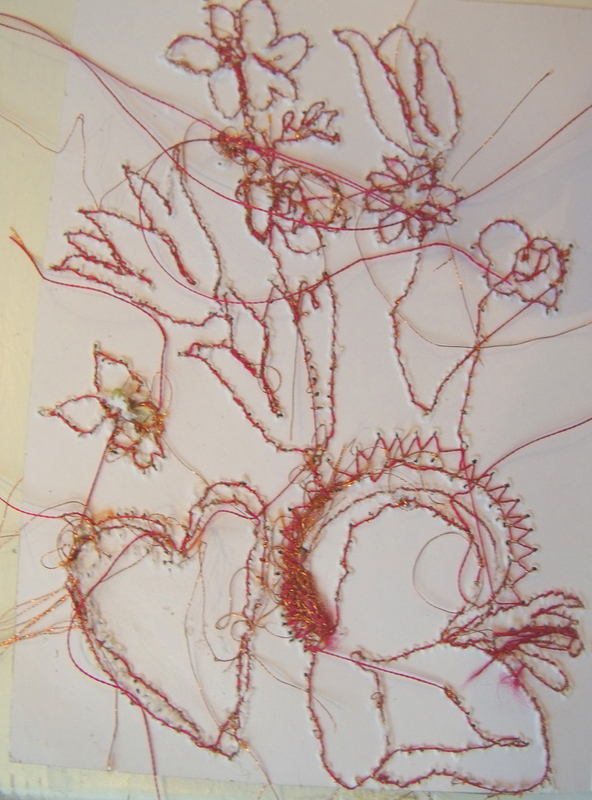 Dail Behennah – Holding it Together, copper wire and thread. 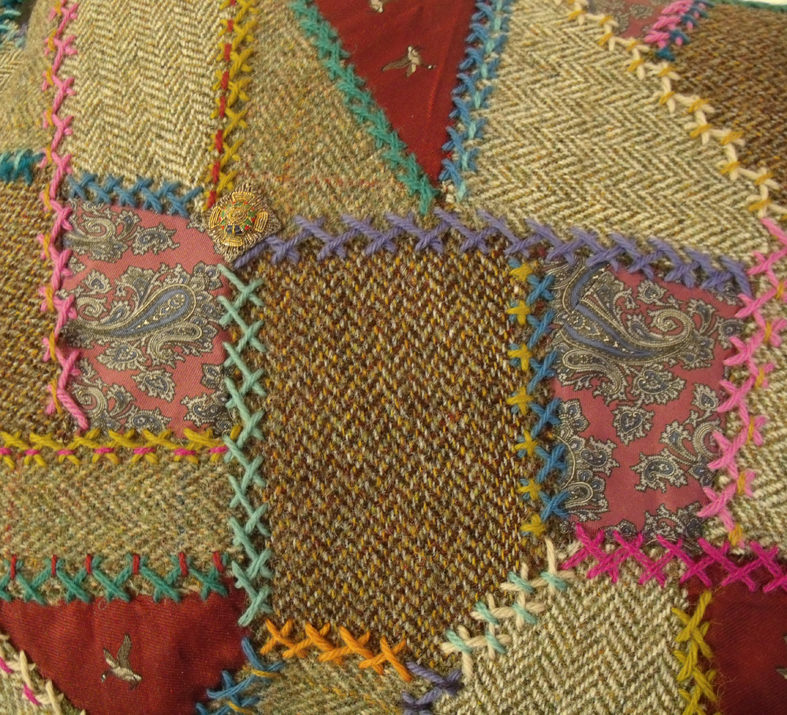 Dail Behennah, darned fabric detail. 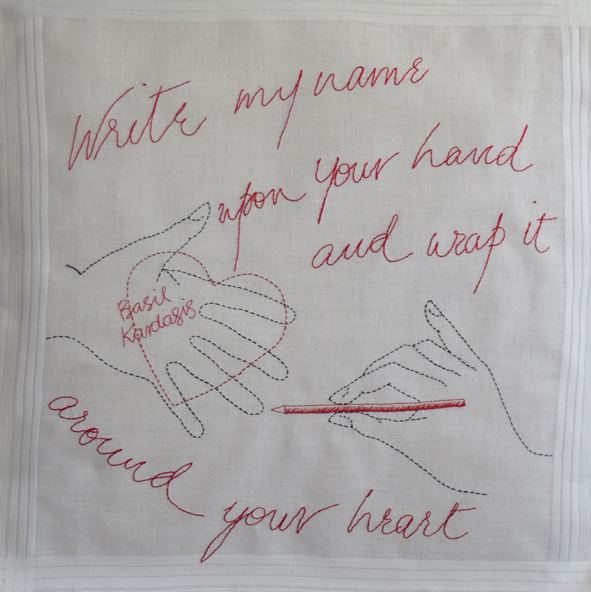 I have made a whole series of embroidered handkerchiefs, let’s face it some nights we have all needed a handkerchief if only to hold on to. 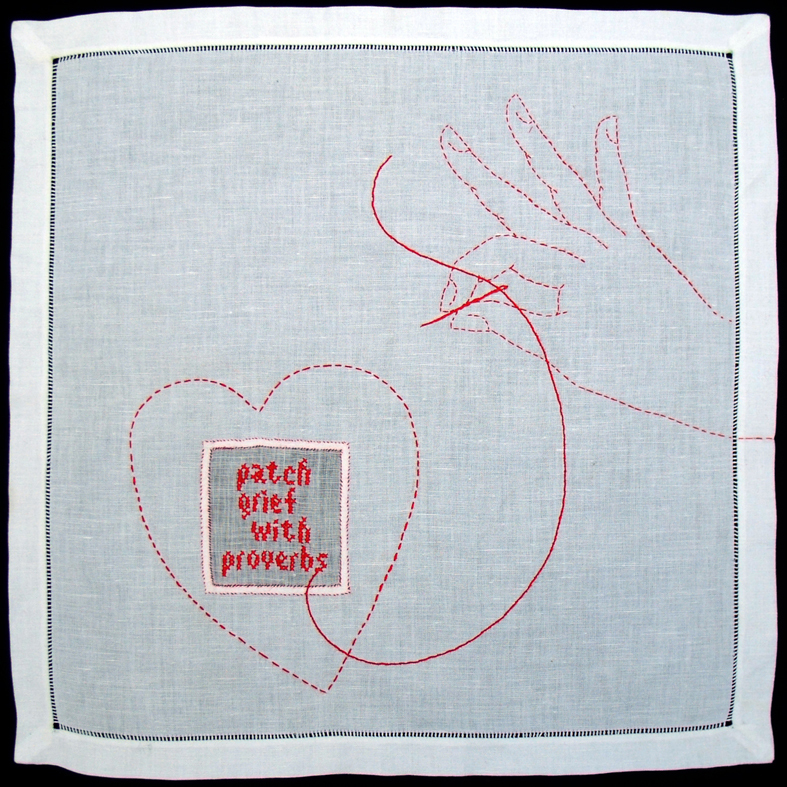 So I have embroidered them with positive mending mottoes and other words of wisdom – the set is called ‘ Patch Grief with Proverbs’ a sentiment that rings true to me. How often we just find ourselves reciting platitudes in response to grief? 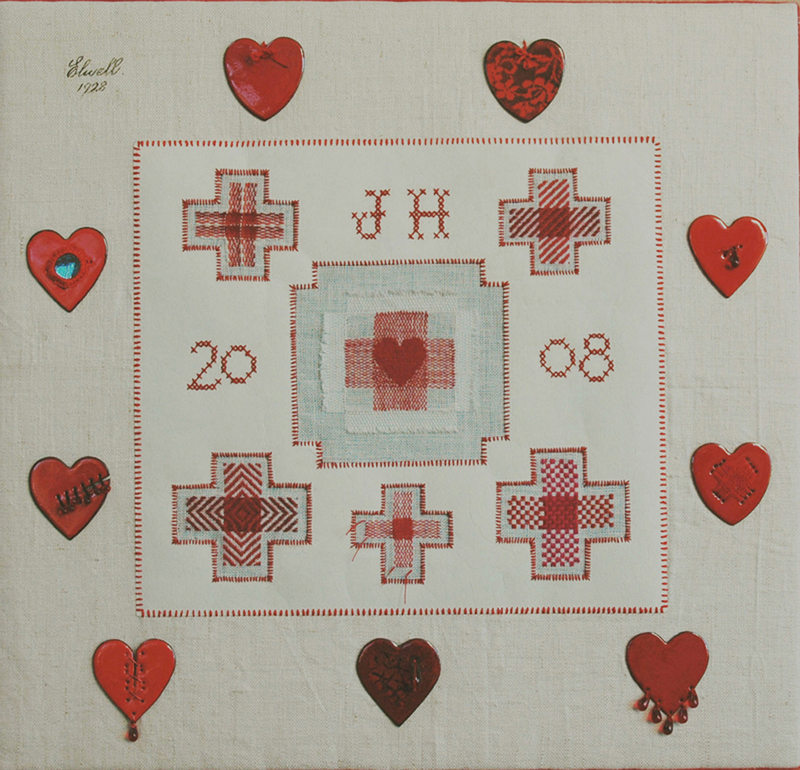 Janet Haigh embroidered linen handkerchief with linen voile patch. 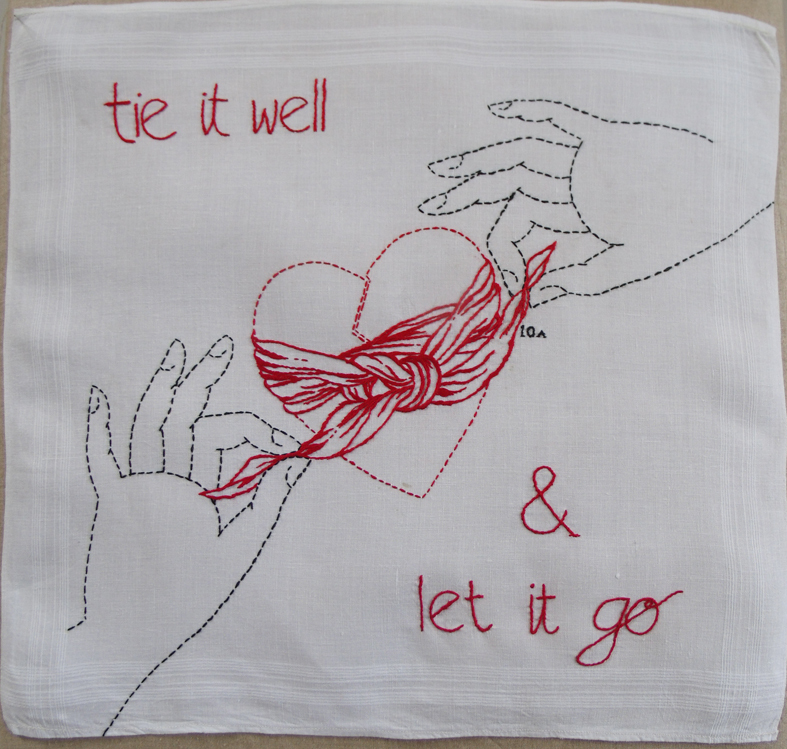 I made 21 embroideries all with their own distinctive darns and patches to reflect the written proverb, they took quite a time to get onto the wall…..I had to search many different sources to find enough texts to make a wall full – but one lovely Greek proverb was given to me by Basil Kardasis and this was the last piece I embroidered – an a very large-scale cotton handkerchief I had to purchase new – the rest were all on vintage linen. 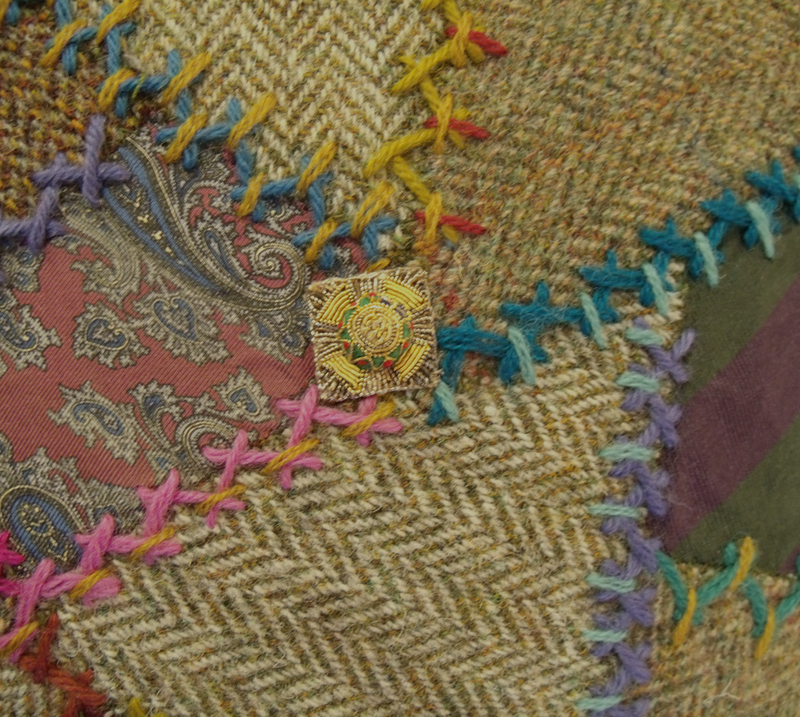 Which brings me neatly to the last exhibitor, Basil Kardasis, his exhibit is called ‘The Buttonhole’, and he collected from his family and friends ( we all had to contribute) ” treasured, revered materials…that may represent them ” and also a button; then , with the help of his sister Ella, spent may months button-holing all the pieces together so that they made a “protective cloak” for his son. Many different materials and articles appear in the cloak, which has a very colourful interior as well, the range of fabrics perfectly reflect his wide-ranging experiencing as a designer and educator world-wide, students and colleagues and friends from practically every aspect of his life gave him wonderful and rare pieces of cloth for this coat, my favourite is a piece of lasered leather in a lace pattern – now this I could really get working on – it only I had much more of it….. 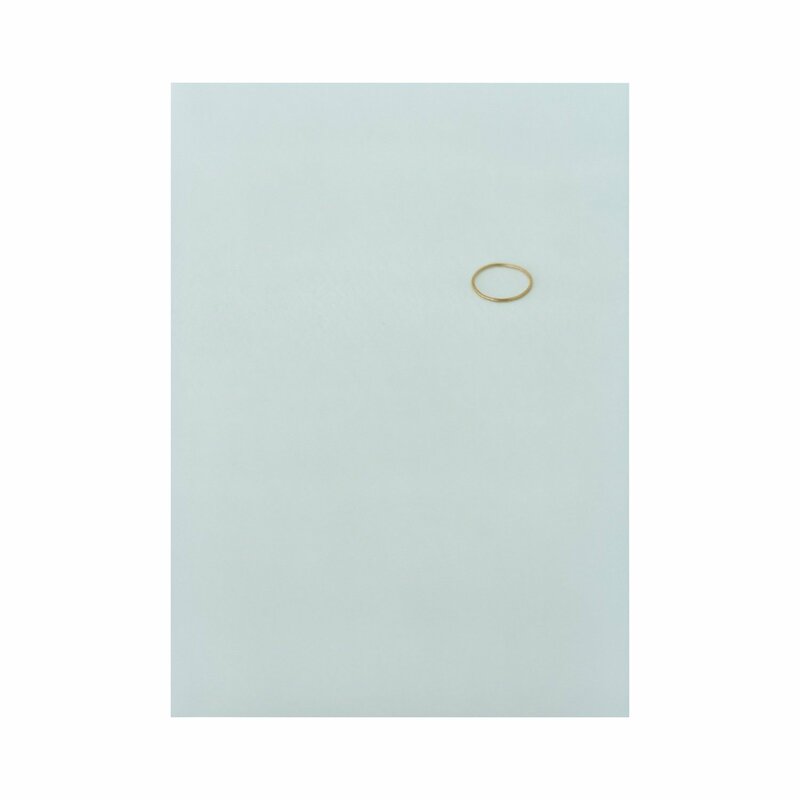 Looking at the image now of this lasered work I am reminded of the joint piece of work that had to be abandoned for inclusion in this exhibition, due to personal reasons by my making partner Hanne Rysgaard. 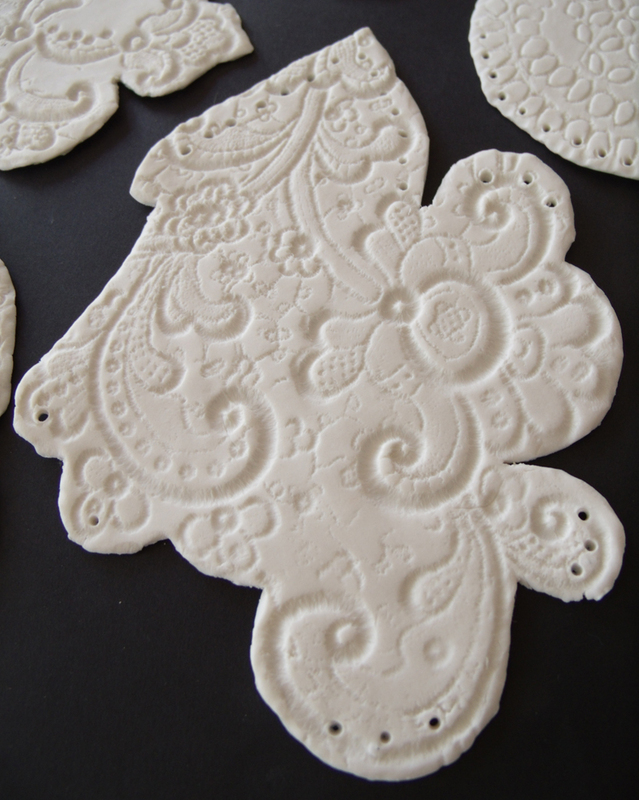 We were making a porcelain hanging from impressed lace fragments but sadly this was shelved until we can both find the space in our very busy lives to get together again and make it. 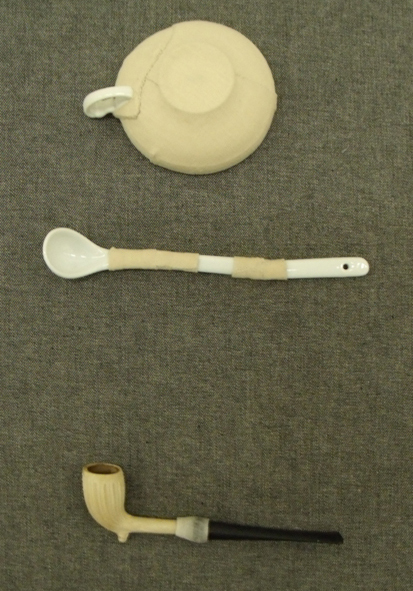 Now I am thinking that these 2 disparate materials may somehow work together…leather and porcelain – Basil where did that lasered skin come from and is there any more? 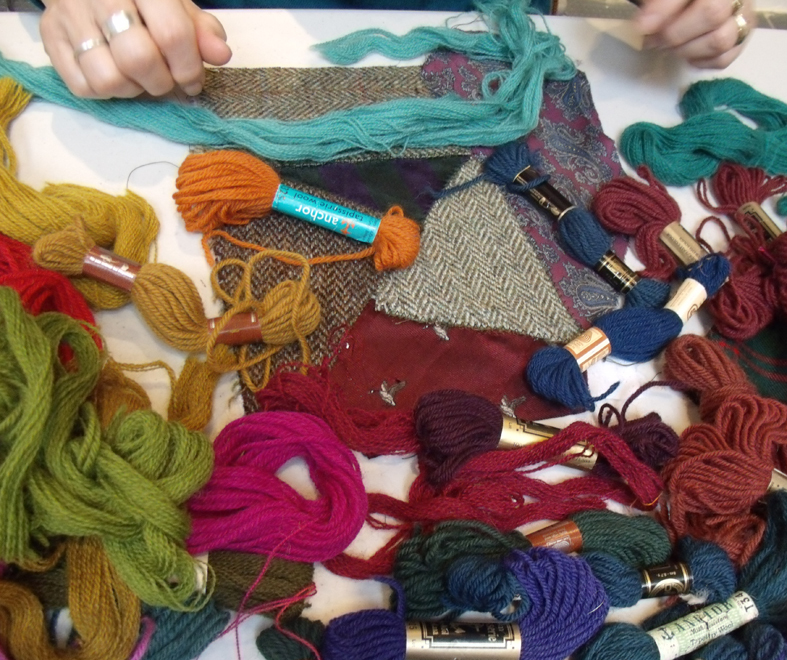 I have been working with Hanne Rysgaard sampling new work for an exhibition of the Stitch and Think research group, called Mending at the Museum which starts in November this year and runs for 6 months at Bristol City Museum and Art Gallery. 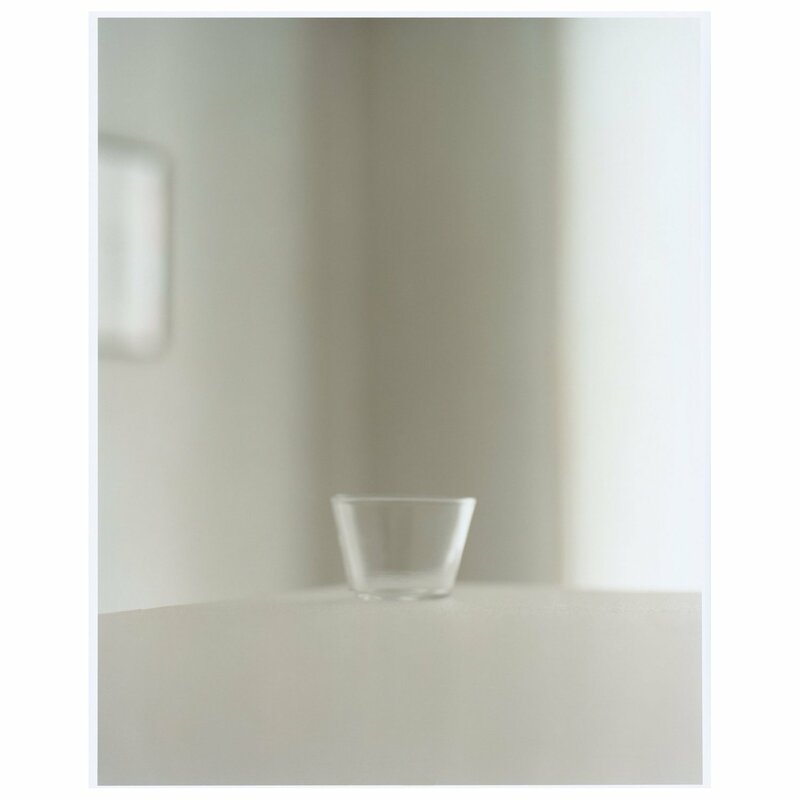 Hanne does not like mended things, in fact she is fundamentally opposed to the idea of mending or using anything cracked or broken BUT she does like transformation – well as a ceramicist she would wouldn’t she ? transformation by fire is fundamental to her practice. 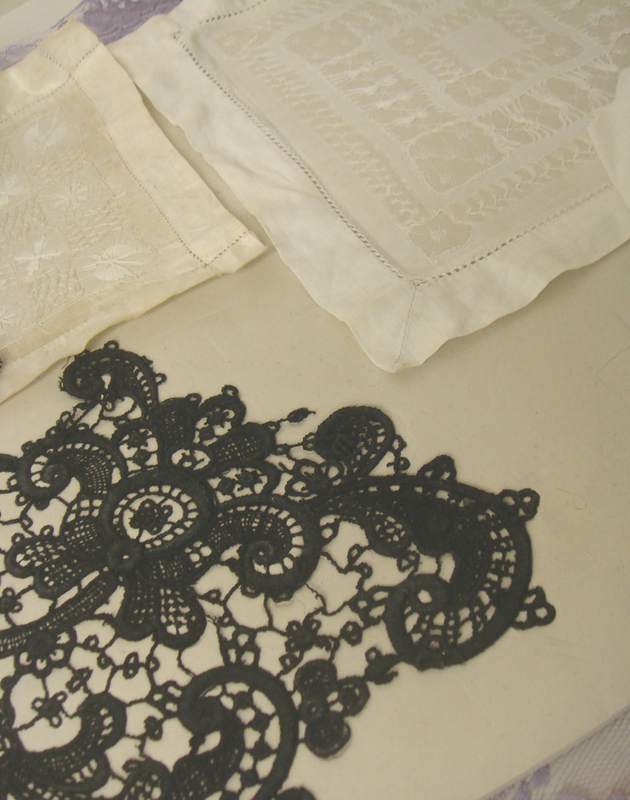 We have been trying to get together to work since our visit to the Lost in Laceexhibition in Birmingham early this year, where we determined to develop some porcelain lace work – possibly a curtain. 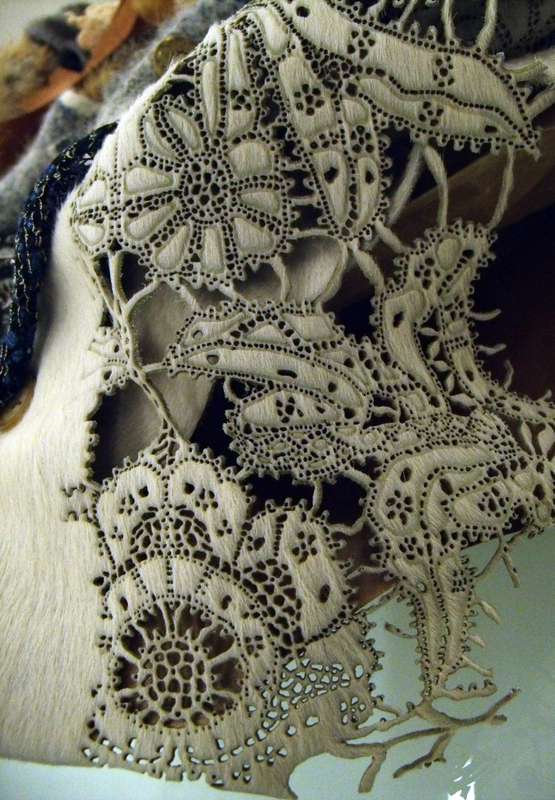 The idea is that Hanne will transform my tattered bits of lace into porcelain and I will stitch or embroider the patches together to make fabric. 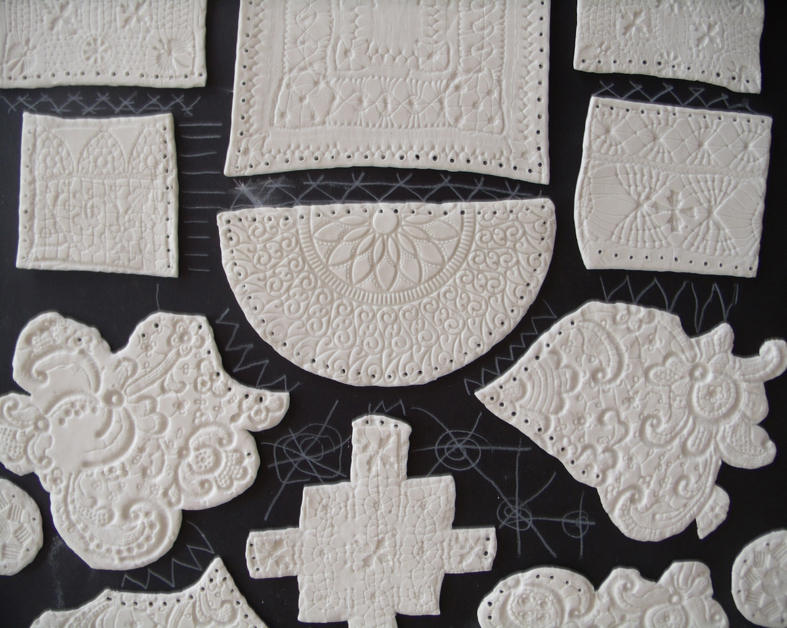 So Hanne prepared some sheets of paper porcelain for us to work on and we set to work rolling several types of lace and drawn thread work into the surface of the clay. She was much the stronger roller – my first attempts were really puny. 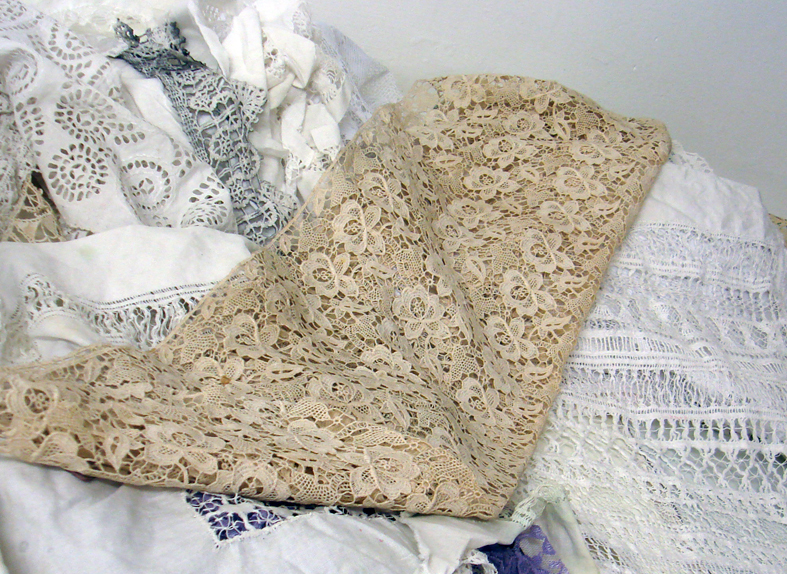 We had placed the larger sheets of lace under the clay as we thought we may want the resulting ‘fabric’ to be seen from both sides. 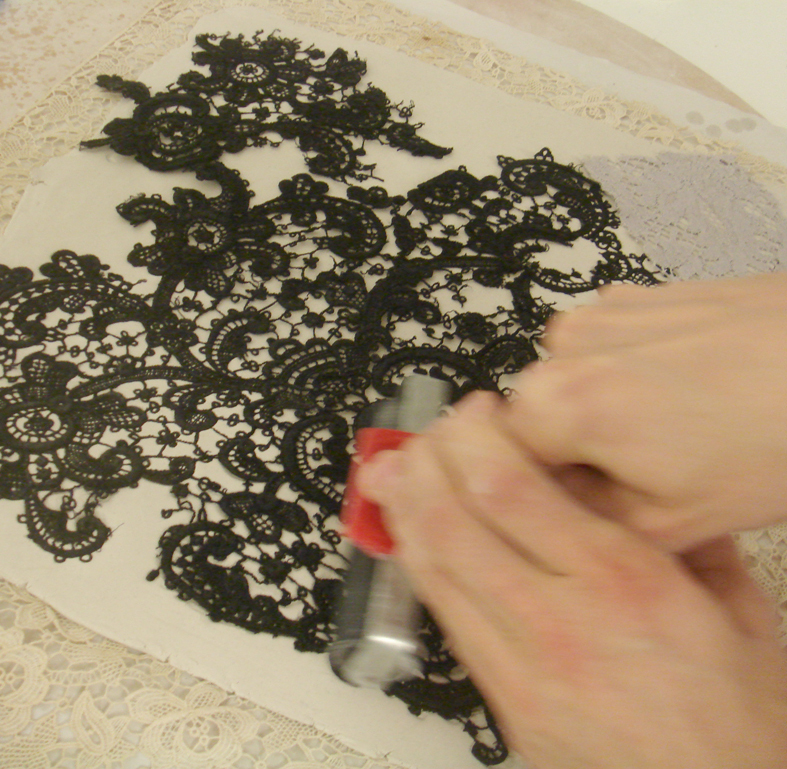 I prefer the stricter linear drawn thread work impressions but Hanne just loved the rich and romantic guipures..
We used all types of patterns to give ourselves a good range to sample with. We needed to ascertain how big the individual pieces could be as this would give an indication of the size of finished piece…I had envisaged a huge floor to ceiling drop of larger sheets of porcelain but Hanne explained that making hand -sized pieces of porcelain was more viable; first the pieces need to be fired without cracking and then be strong enough to be handled later when being stitched together+all my scraps of vintage lace are damaged and small sized, but how else could I have afforded to collect such lovely pieces? 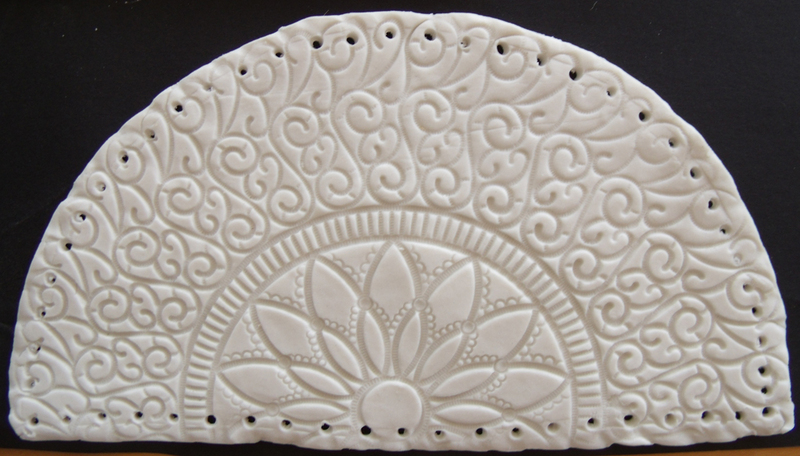 As you can see the first impression in the damp clay is stunning, so crisp and clear, we were whooping with delight at the fine detail, every stitch can be seen and this is machine made lace. 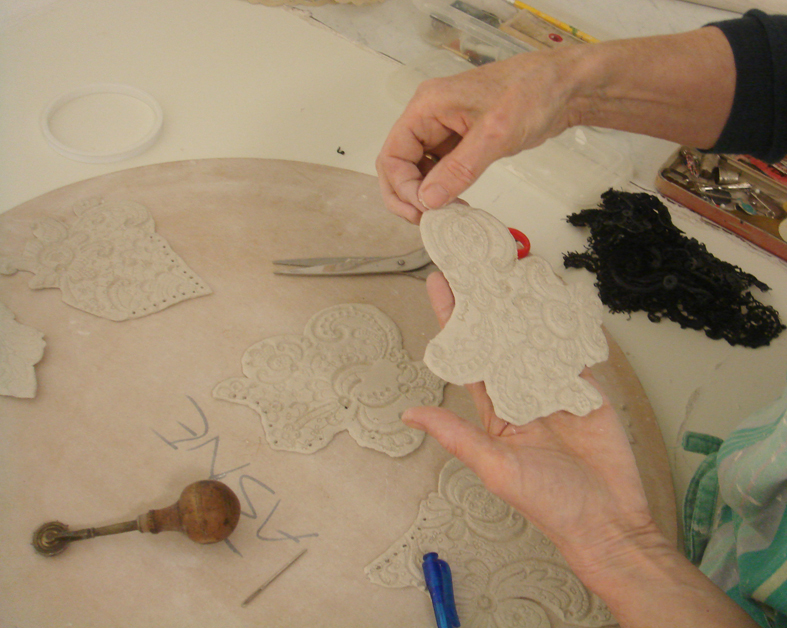 We now had to cut the lace into shapes and I was amused to see Hanne pick up a pair of scissors to cut it; but first I handed her an old fashioned tailor’s tracing wheel to impress regular holes in the surface where I have to stitch. 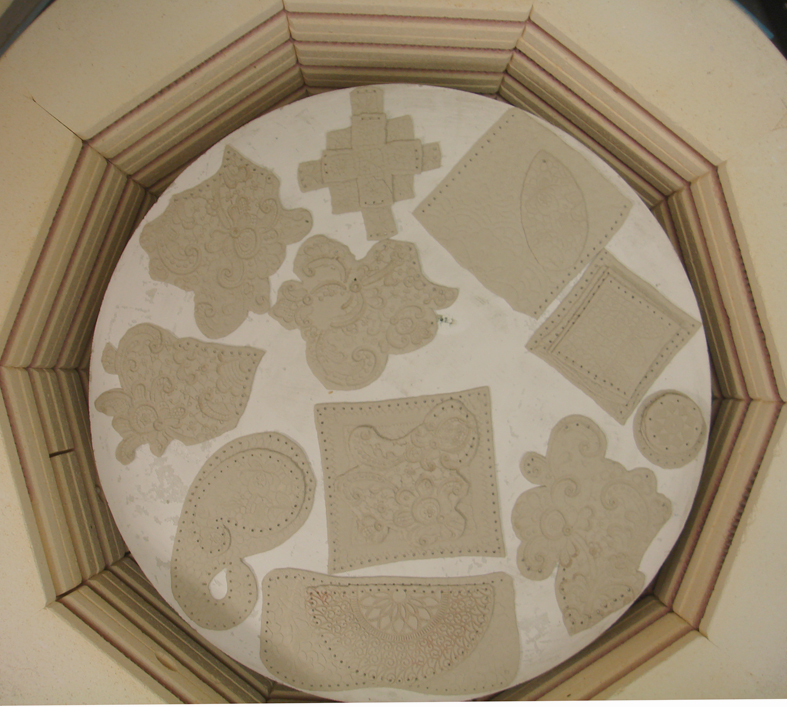 We placed the holes anywhere we thought useful – we will have to regulate these more carefully on the finished work. 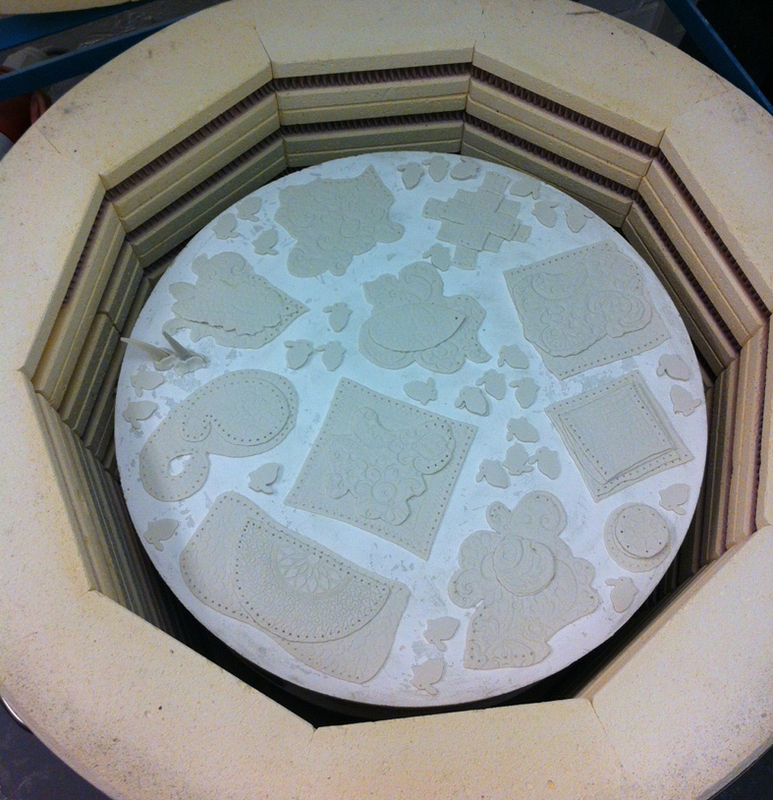 Now to the kiln…Hanne packed it…. 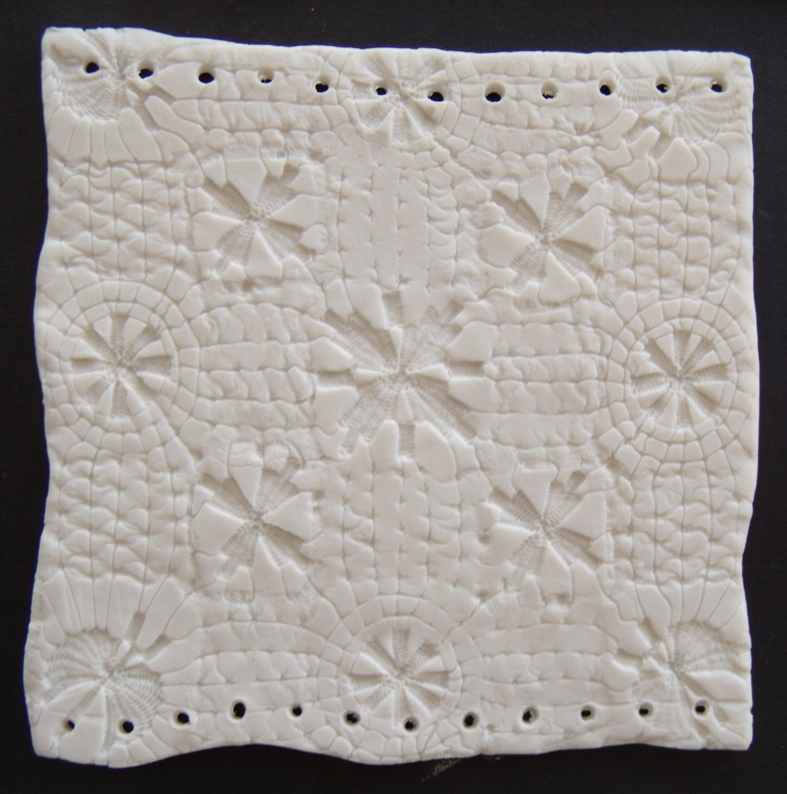 The pieces are slightly smaller but the holes are fine for stitching, the quality of the unglazed porcelain is so like a starchy linen fabric that the transformation is uncanny – they look like material but are brittle and now all uniformly white….ethereal. 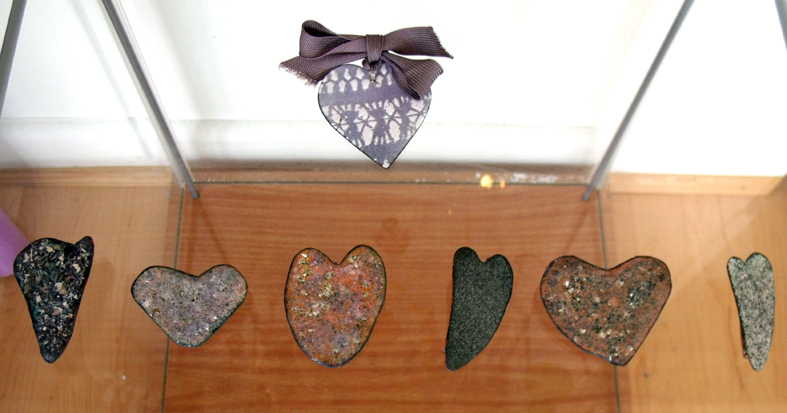 and like similar transformations in vitreous enamel, plastic lace often makes crisps and clear impressions. 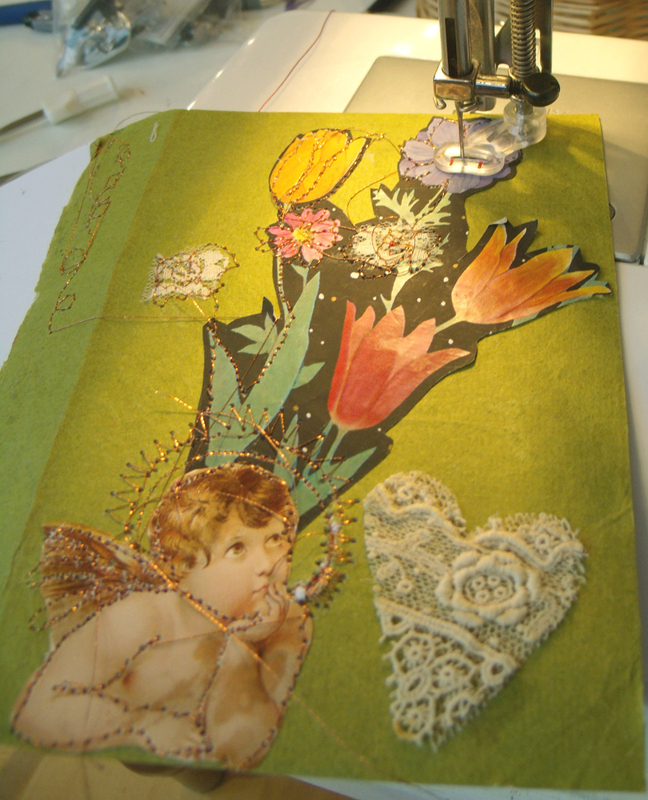 So now it is over to me to develop the new fabric, I start by placing the different pieces in formal patterns – I originally intended to use wire to stitch between the gaps using decorative lace like stitches to fill in any spaces….now I realised this was not going to be at all easy, even at this moderate scale. The wire won’t behave well – it needs careful and regular stitches to develop the rhythm required to give embroidery its formal beauty. 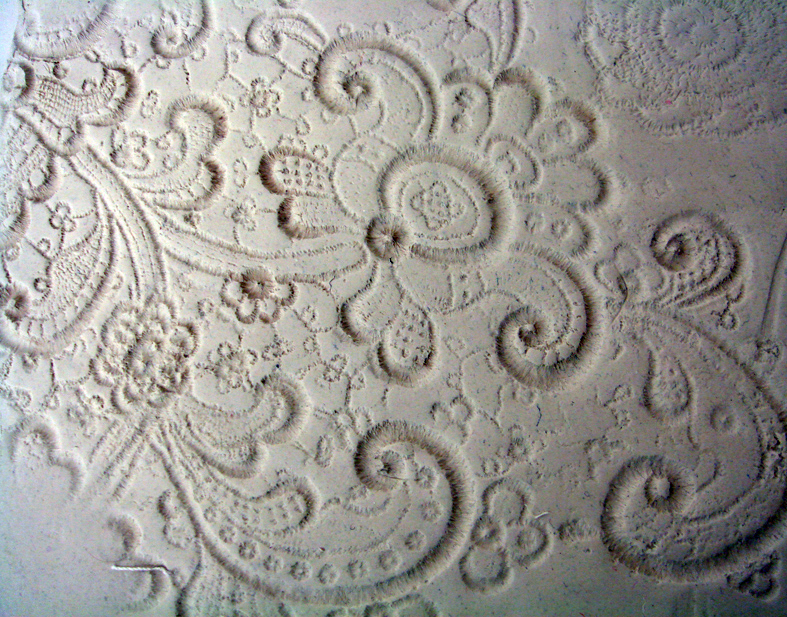 motifs arranged formally as a lace curtain design. 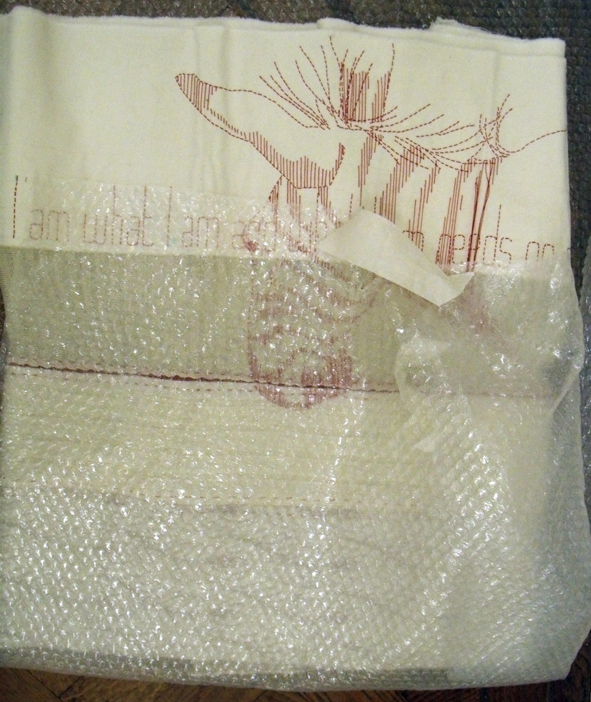 but it became obvious that I will need to use a backing fabric and applique the motifs onto it, this will act as some protection but it has to take the weight of the porcelain, so now I am researching silk organzas, cotton organdies and maybe netting…as we are both designers and therefor pragmatists we are liking the transparent quality of the organza first sampled – and applying lace motifs on a pre-made net ground is used as a lace making technique. 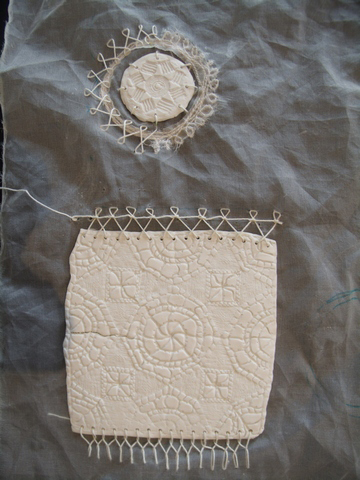 I have a long way to go before this fabric begins to do justice to the quality of the impressed porcelain motifs….. This is a first for me and I want to share it with you – I am, from today, exhibiting in America. I have 2 pieces of work in an exhibition called Mending = Art showing at the Gershman Gallery in Philadelphia and this evening I should be at the private view, but instead I have just returned from Heart Space Studios having run a birthday party, making beaded brooches with ten 9 years olds – and very enjoyable it was too. 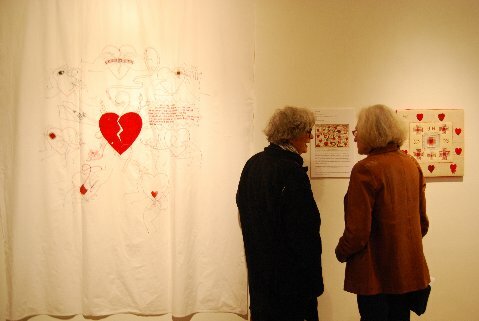 But how I would love to be seeing my work in an international exhibition at such an amazing event as the Philadelphia biennial textile art festivalFiberPhiladelphia 2012. 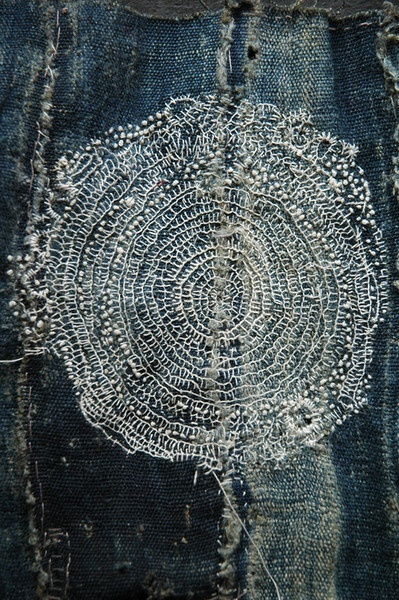 The call out came early last year, from American textile artist( she of the wonderful brilliant red website) Diane Savona, for textiles made around the theme of Mending…this must have been the universe answering my call. 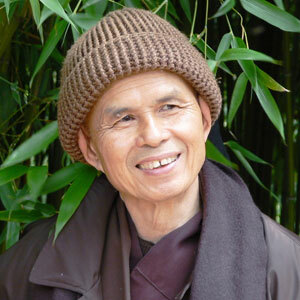 I had several things on offer, as looking at the ‘ Ongoing Work” section of this blog will show you. But unusually she also asked me to send her an image of the inspirational early woodcut that has inspired at least 10 years of textile and enamel work, and mending was the subject of my first post in this blog. 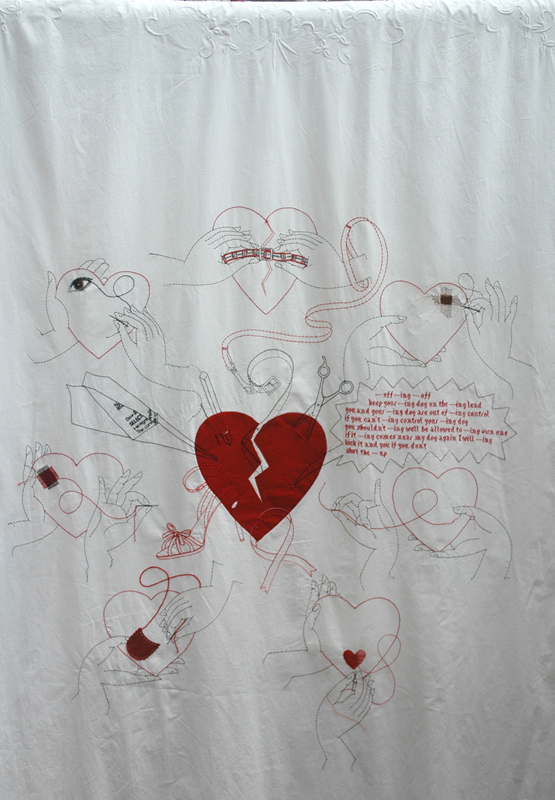 and above is the other work that Diane chose to represent my mending embroideries, a real heart-felt cry now that I look back on it, I can remember every stab that contributed to this image but then yoga certainly reaches the parts the needle can’t. 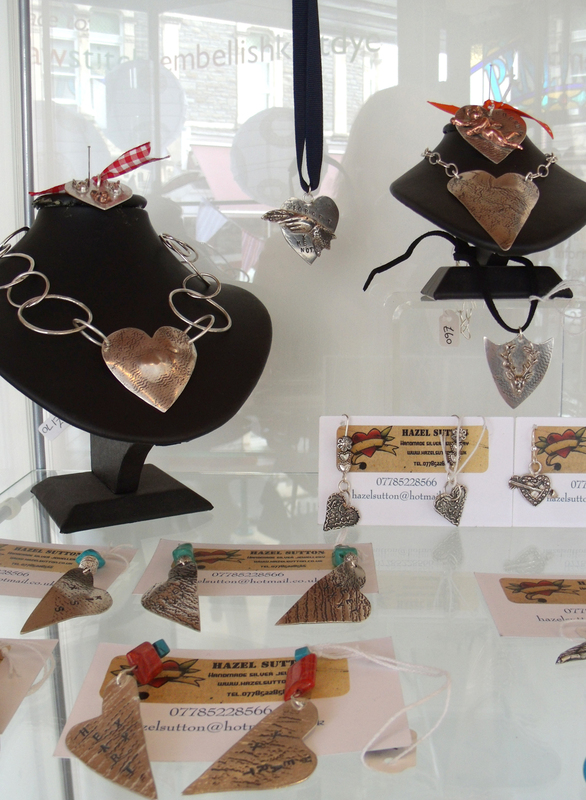 OK so it’s the day after the night before day and here are the pictures from the exhibition sent today from Diane Savona. 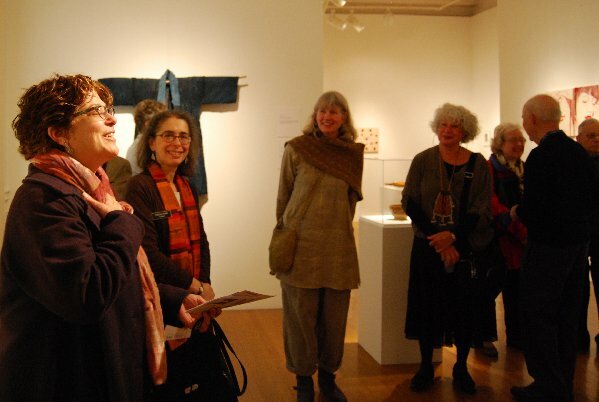 from left: Amy Orr (organizer of FiberPhiladelphia) Miriam Shapiro (curator at the Gershman) Dorothy Caldwell and Libbie Soffer, as Amy says a few words in front of the Japanese boro from the Liao Collection. 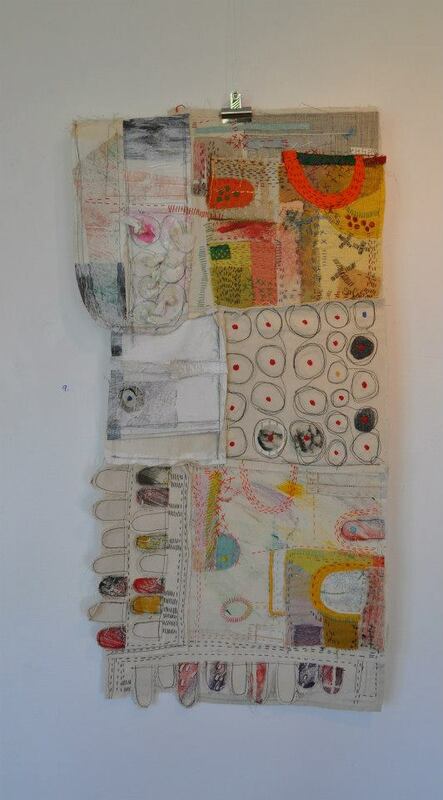 then there is my work hung together with Frau Minne keeping count in the middle of it all…. 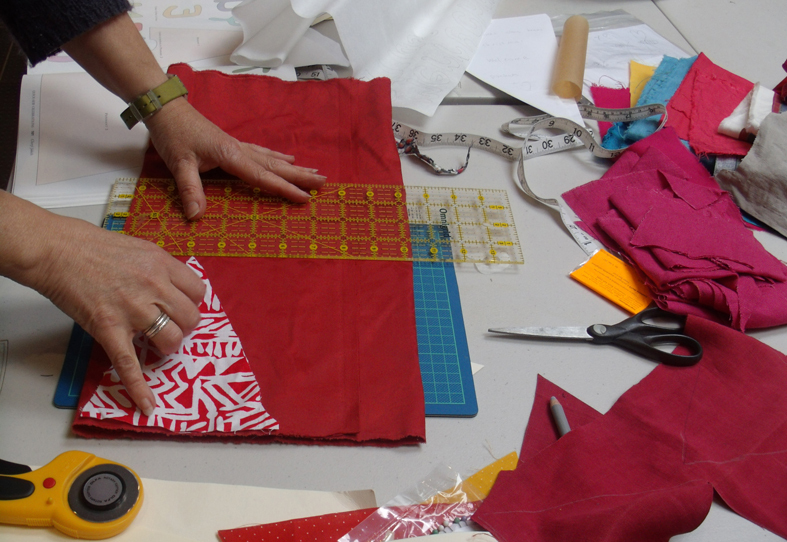 something tells me that that red and white is the new black, white and grey of studio art textiles…..
and yet again…..well mending seems to = blood red for a whole lot of women. 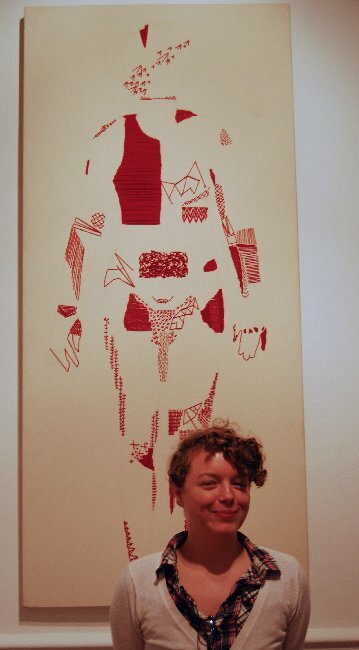 Erin Endicott in front of her work……ooooh!!!!!! The most hits my blog has ever received in its entire life span of 18 months, was shortly after the Commemorative Crazy post, and many people contacted me saying how much they liked the content and story. 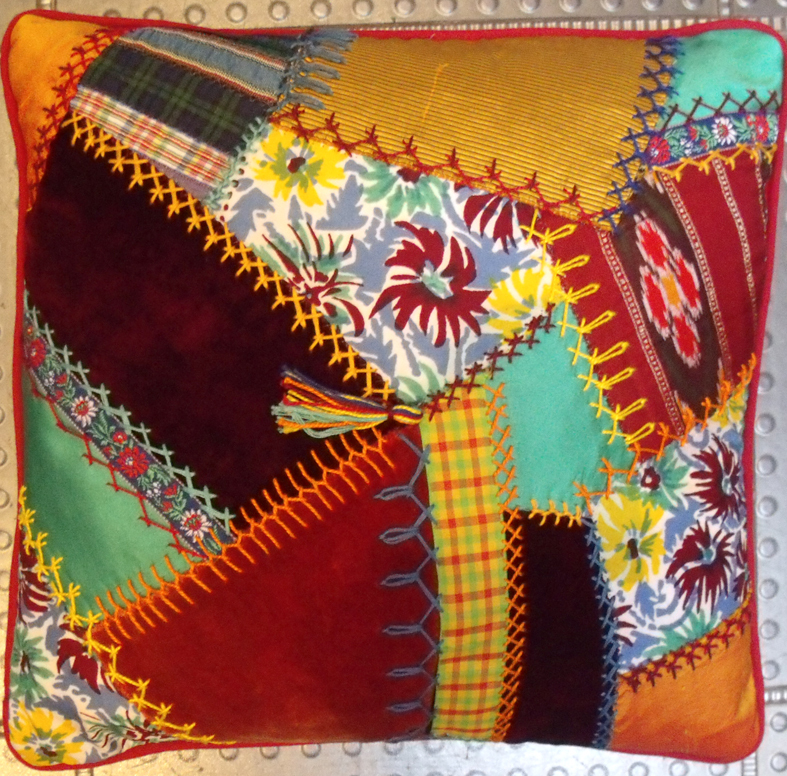 So I was delighted when Jane called in to Heart Space Studios to show me the finished cushions that she had made in time for Christmas for her 2 children. She had embroidered “DAD” on one, at her daughter’s request, it is in whipped running stitch, very subtle and almost merges with the tweed background. And amongst some other memorabilia, Jane found her husband’s ‘pips’, these are badges usually in the shape of a star or a crown and worn by army officers on the epaulettes of their uniforms. 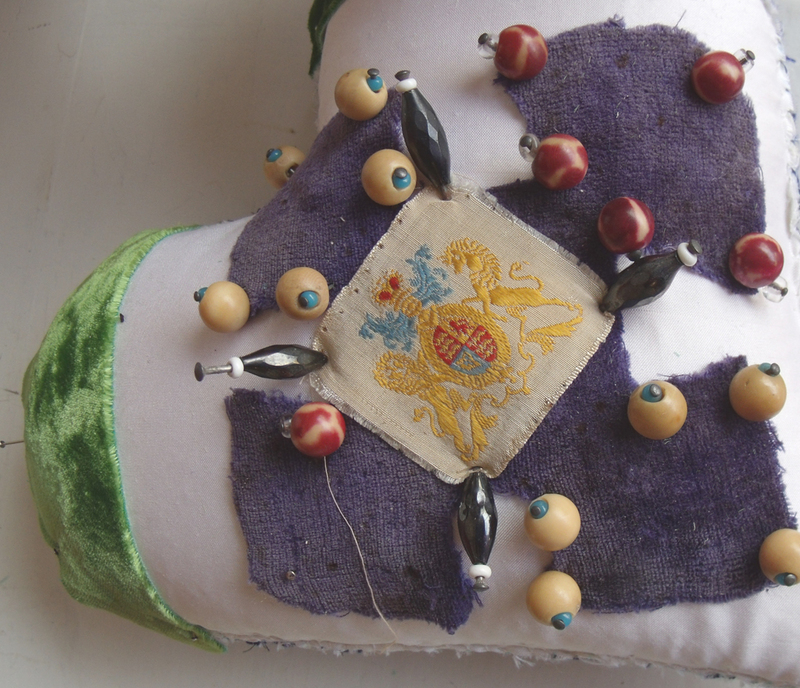 These particular ‘pips’ are actually stitched onto fabric in gilded thread so two of them they were put to good use at the seam joins of the crazy stitches. 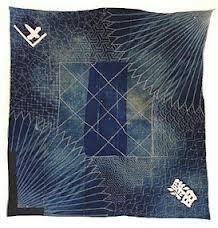 Usually a star is stitched at such points by the embroiderers of the traditional crazy patchworks. 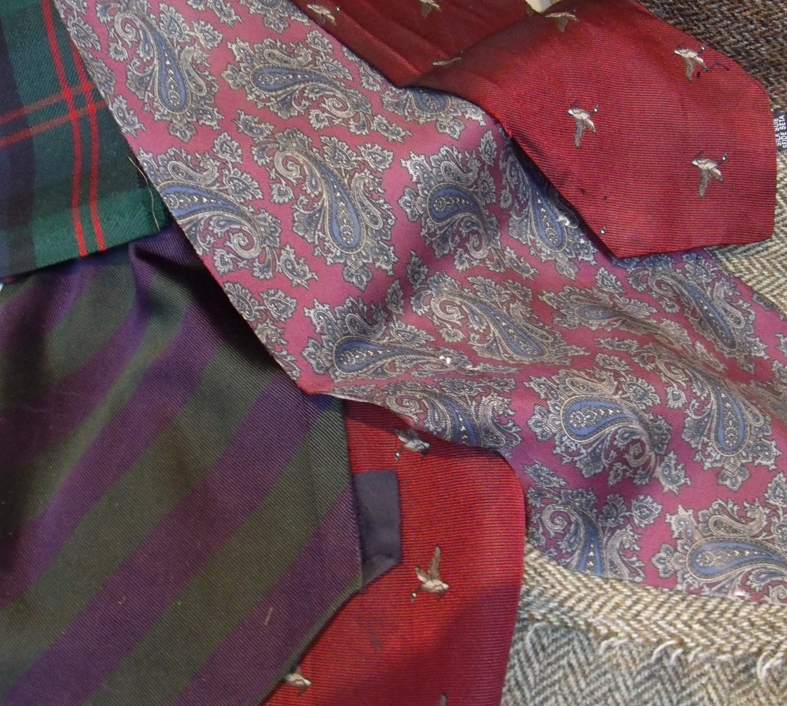 Jane has enough fabric to make another cushion for herself and even some smaller gifts for other members of the family…. 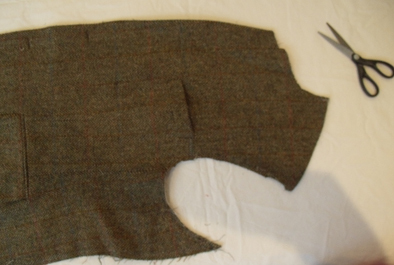 and then she may decide to design and make the large throw from the remaining tweeds. I will keep a record of this progress. 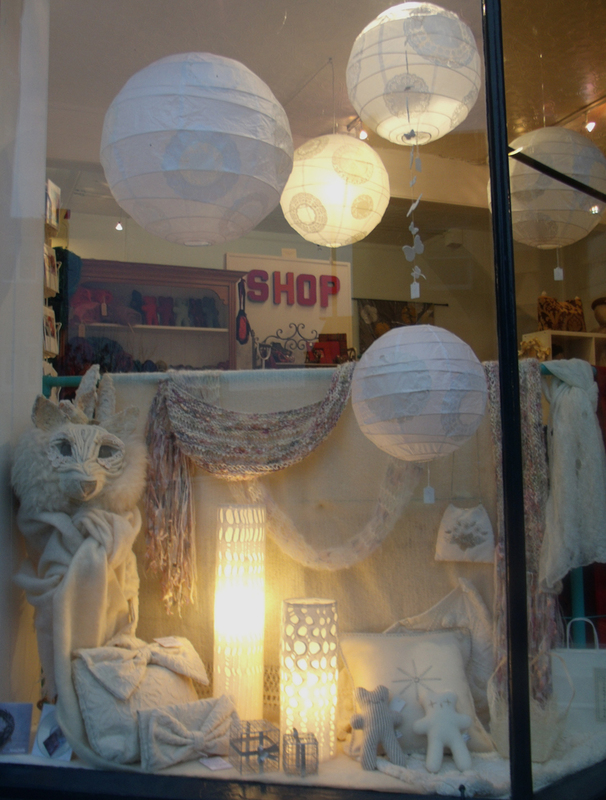 I am not a big fan of Christmas, I prefer New Year with its promise of a fresh start and better times ahead…but here at Heart Space Studios everyone expects us to do a Christmas window at least. 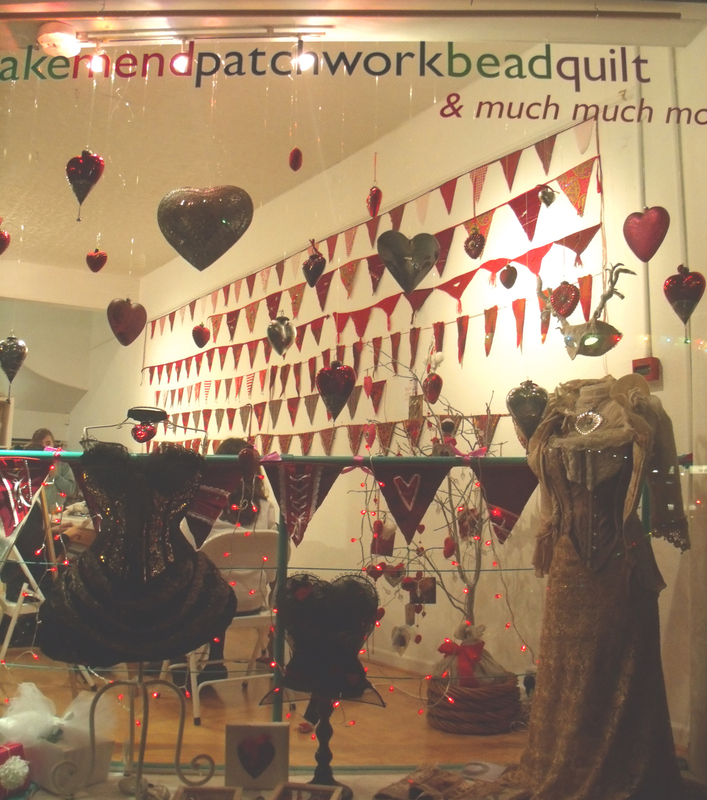 But with a refurbished shop to launch, the powers behind my shaky throne decided to put out all the flags – well bunting to be precise – and go for it….hot mulled wine, mince pies and a late night opening party. 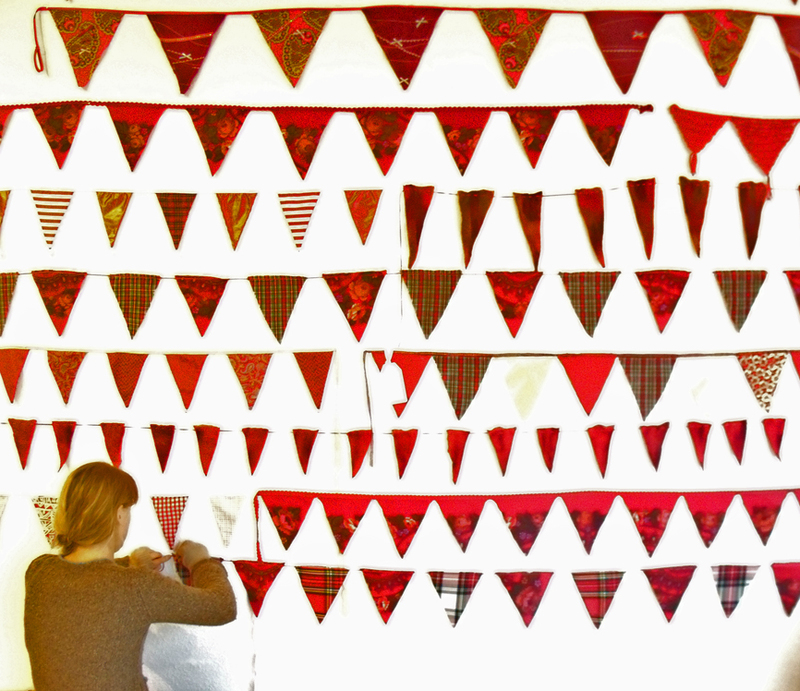 Added to this was an idea for an exhibition of bunting. 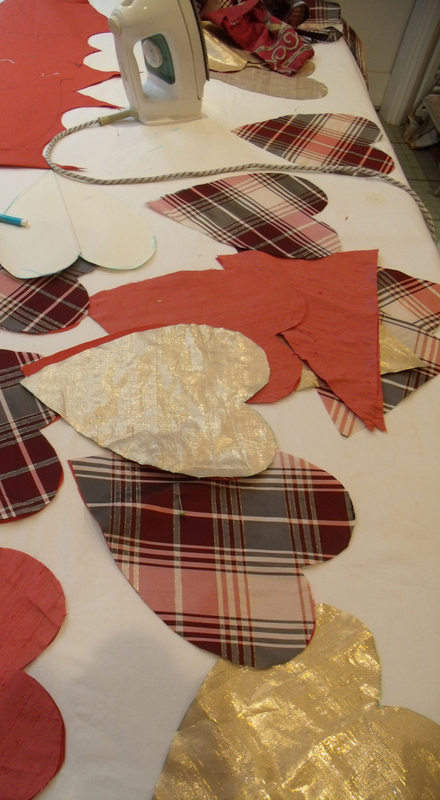 Meanwhile all the tutors set about producing bunting…Debbie Bird held a class on making it and so Heart Space admin, ( Sophie Bristol and I) turned up to find out how to do it.I made several attempts at heart shaped bunting in very tasteful fabrics…they were soon abandoned. What I needed was a contrast to the white spooky windows..I realised I was trying to reconcile 2 different atmospheres in one space – so the only way to go is complete contrast, the more extreme the better. We would have one red window and one white. So I found an old and very crude Russian shawl in my stash, I hand painted the mustard coloured roses with some pink and purple dyes and then cut it up; next I went for glitz – why stop now? 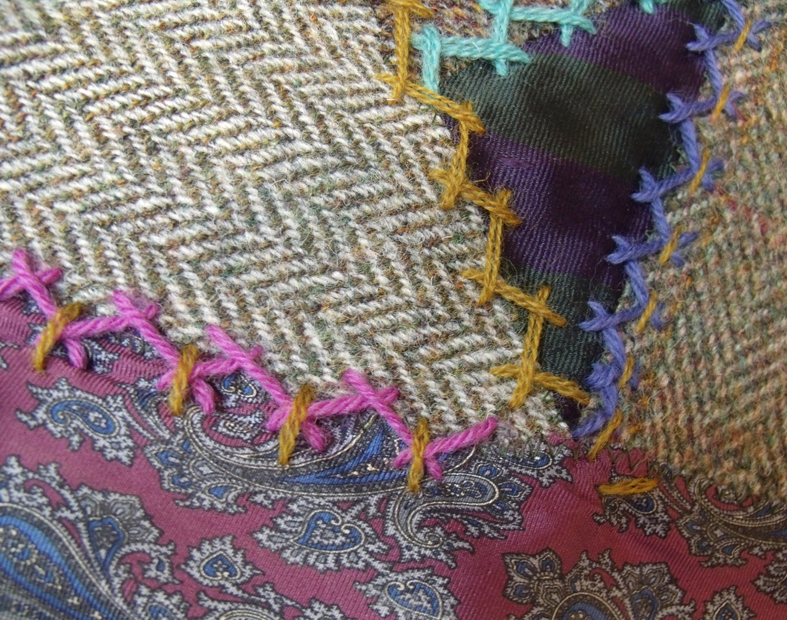 then I added tartan, I do love tartan and paisley – I couldn’t bring myself to cut up any of my old woven paisley samples – far too precious, but I had at last found a use for this old neglected shawl. 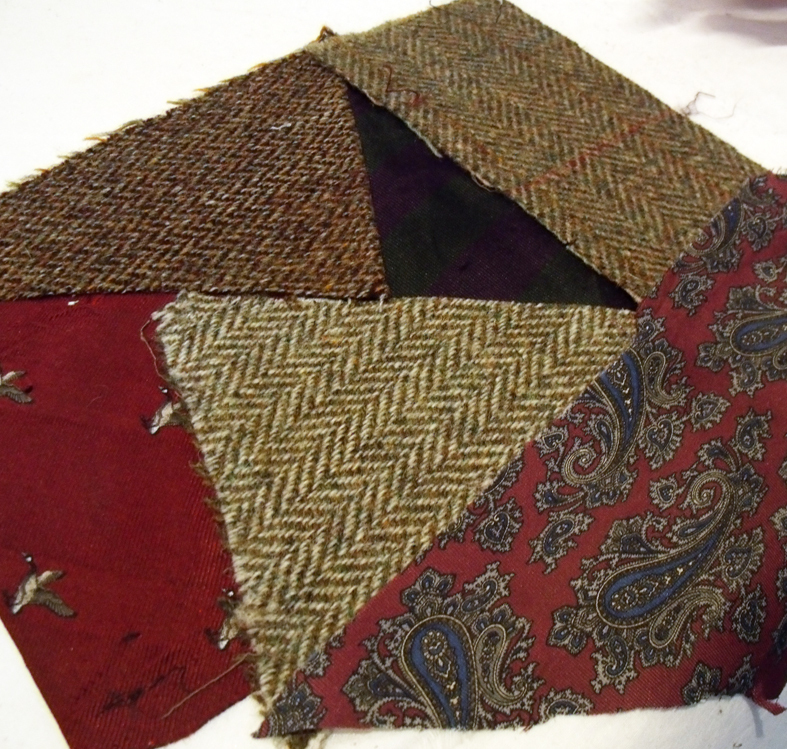 I didn’t bag-out the pieces but just cut them and left them, as they are cut diagonally to the straight grain they shouldn’t fray too much, and hey it’s only bunting…..I set about making 5 lines to sell. But then we had to start stocking the shop. The first thing was to get one area working properly to set the tone for the whole place. 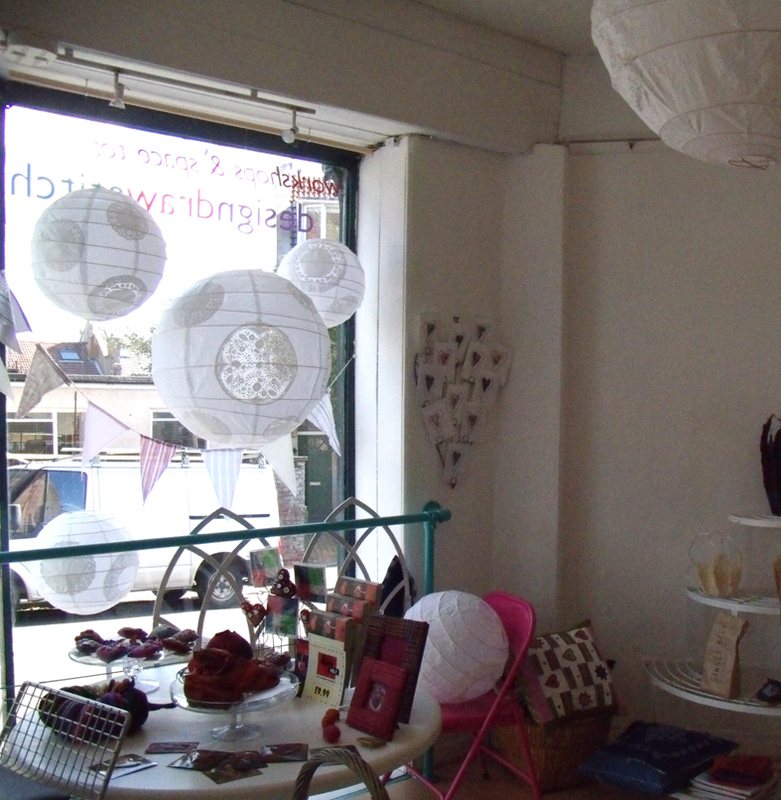 An old and true saying is ” you can’t sell from an empty shop”; so we piled it all in, colour co-ordinated of course. 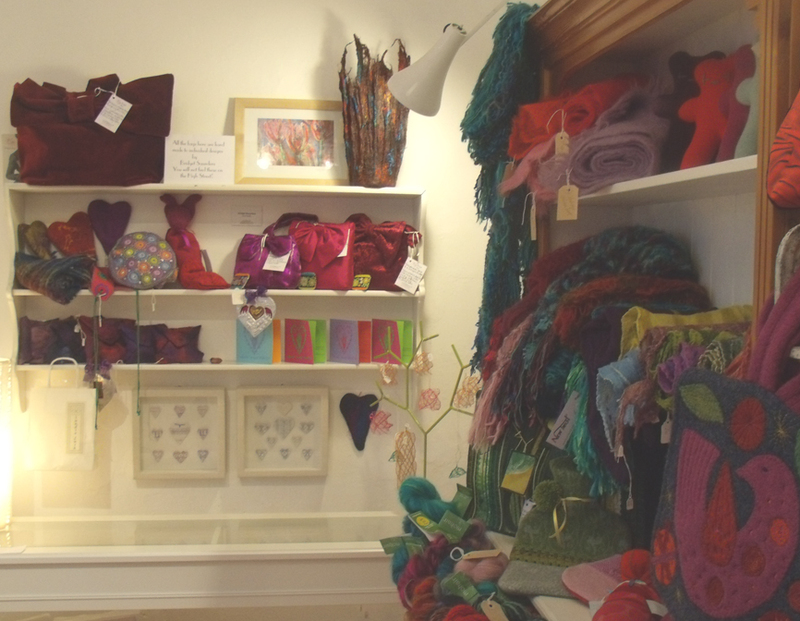 Teresa Searle’s felted and embroidered bags, mittens and cases look wonderfully colourful, setting the standard for the rest of the shop, my hand embroidered felt letters look strong and clash nicely with the work beneath. 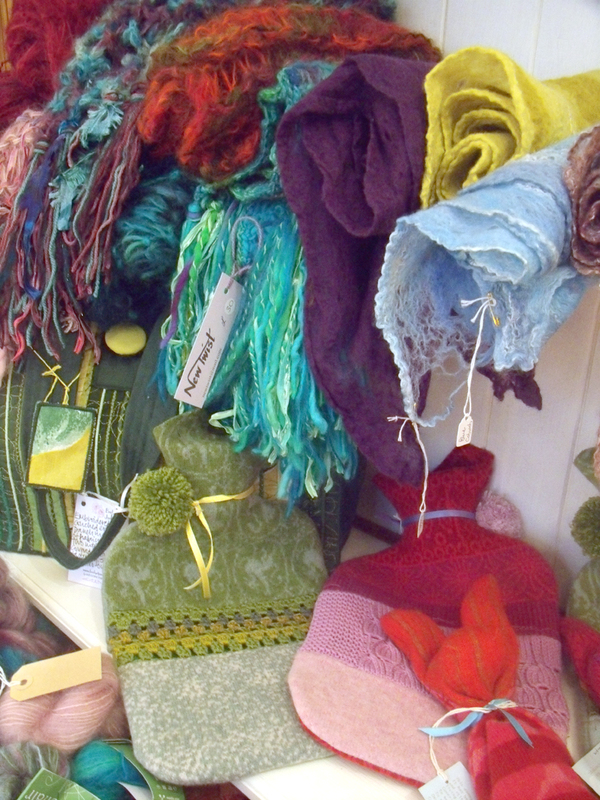 And the pile of scarves hand knitted by Sarah Thorpe go happily with Janet Clarke’s beautiful soft coloured felts. For real winter warmth, the knitted and felted Hot Water Bottle Covers and neck warmers made by Steph Wooster all mingle together. The shop starts to look like it is in business. But what about those windows? The winter white one came together very quickly, it is now stocked with cream and white woollen goods for sale, with the 3 headed animal standing sentinel. 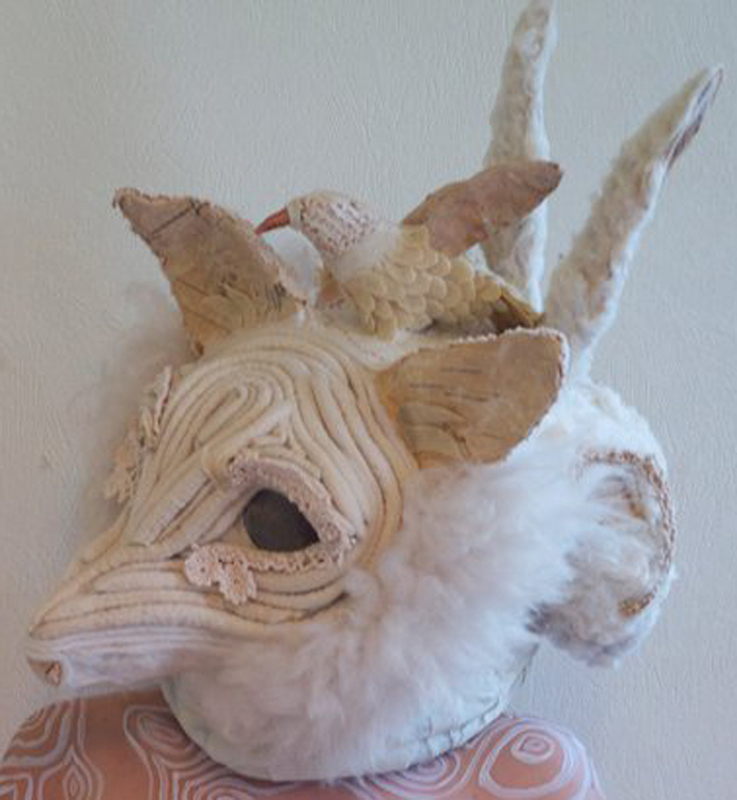 But the other window was more of a problem, the costumes that had been brought didn’t fit our stands and there weren’t enough animal masks to make an impression, beautiful though the horned mask is, by Jenni Joule. 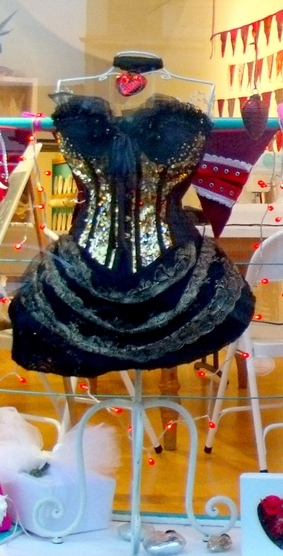 I needed more red stuff to link with the bunting on the wall behind…so I asked Lisa Keating who was running a corset making workshop for us, if she had anything suitable to contrast with the white and silver and she lent us this wonderful glitzy black and gold number – now that’s what I call a contrast. 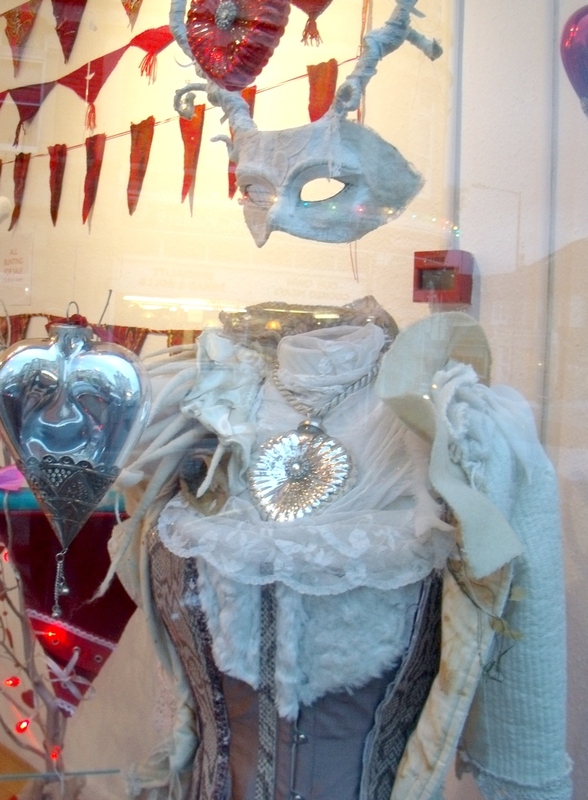 Then I took every red or silvered glass heart from home and hung them in the window – my house now looks bare – but the Christmas windows are paramount. Eventually everything was finished and looked totally intentional; always the way when a design works out well, you can’t imagine that you ever had any other ideas than the finished piece. 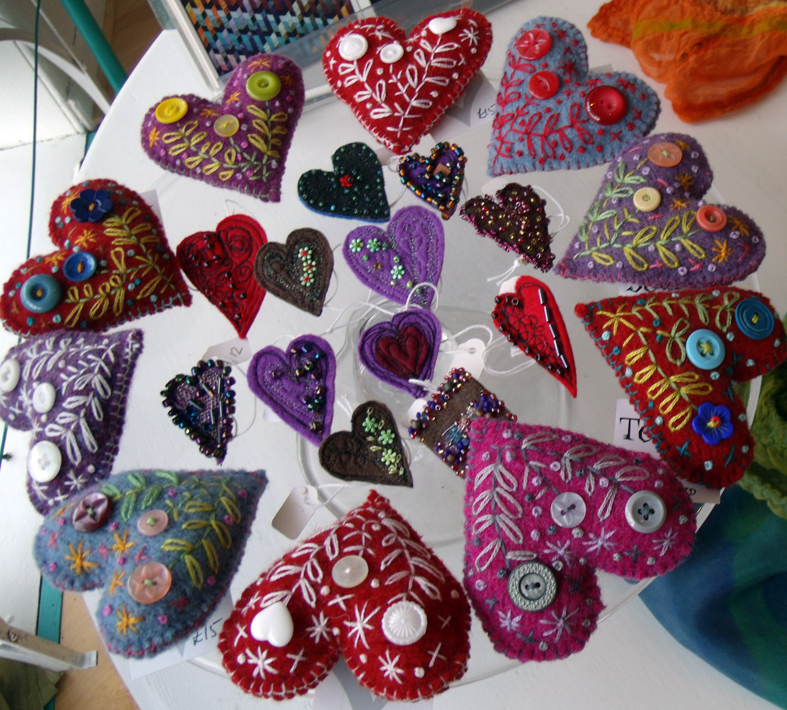 It is the 11th of the 11th 2011 and I am in commemorative spirit; yesterday atHeart Space Studios we made the beginnings of a series of commemorative crazy patchwork pieces. 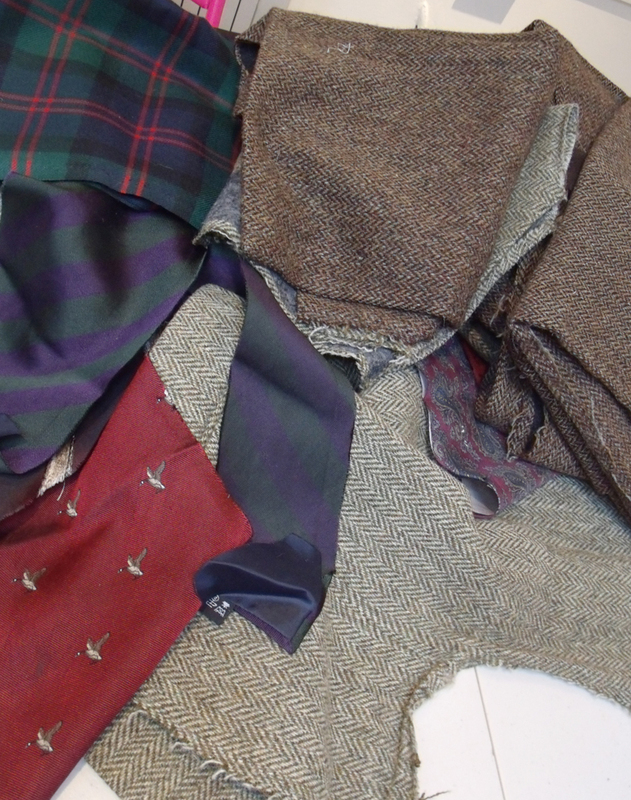 After the last Crazy Patchwork workshop one of the participants Jane, asked me if I could help her make some more patchworks using the beautiful tweed jackets that had belonged to her husband, she could not bring herself to throw them away after his death, but now saw a way that she might be able to use them to make gifts for their children. 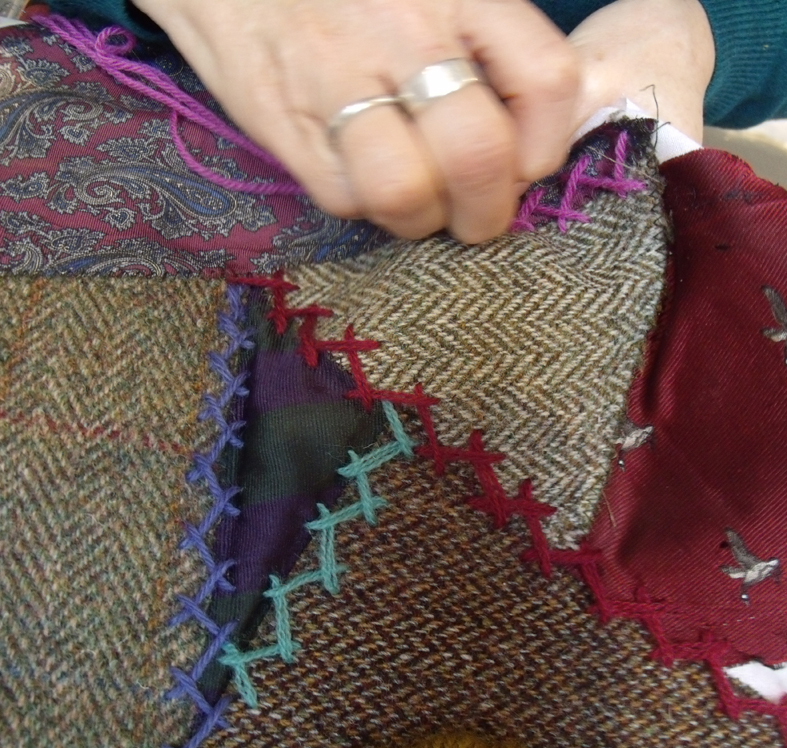 I was very pleased to be asked to conduct a one-to one session with her to help cut into the jackets and organise the patchworks. I knew it would be really difficult so I volunteered to cut into them for her , suggesting that she make a start by unpicking and when she arrived she had carefully unpicked and pressed them all; 3 beautiful tweeds in soft shades of beige, grey and brown and she also brought some club and military ties that she had been unable to part with, and a piece of her husband’s Scottish clan tartan. This is what I find so compelling about many old and used fabrics, the story behind each piece; “Make, Do and Mend” is not such a simple statement when applied to projects like this. 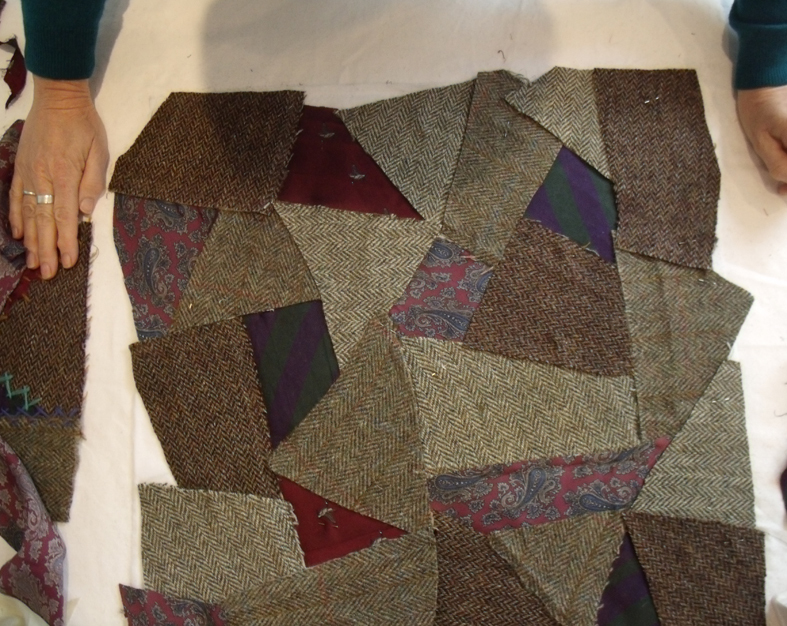 The first thing to do was to cut the cloths to make a sample piece of patchwork. I wasn’t taking any chances with such valuable fabrics. But the colour that really delighted and just kept calling to her, was a zingy hot pink – not what you would imagine for this soft and hazy set of fabrics, but it demanded to be used, Jane kept laughing every time she picked it up. the pink thread that just had to be used. 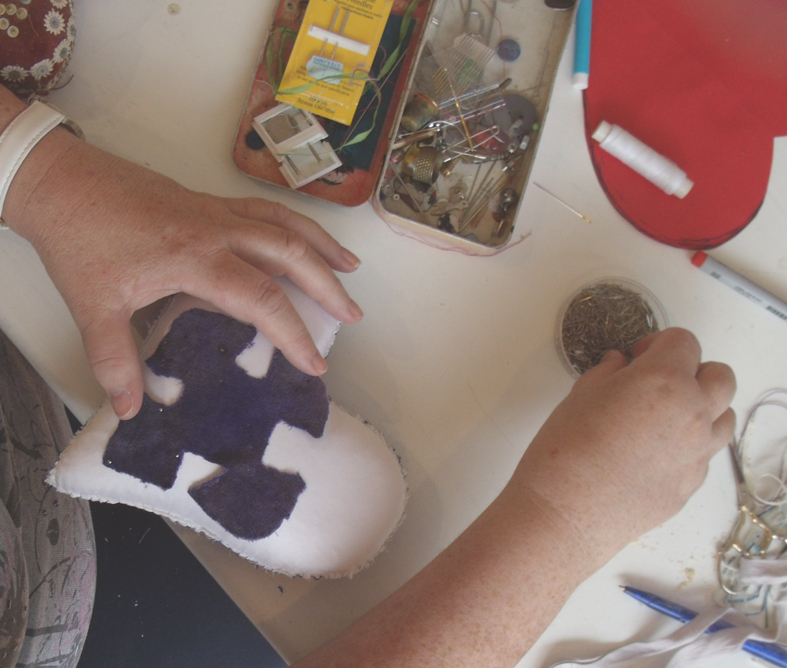 We also discussed putting a message or an initial onto the piece, and I explained how in the Crazy tradition there are lots of written messages..so she is writing her husband’s initials on a corner piece of each cushion, but has just emailed me to say that her daughter wants her to just write ‘Dad’ on hers. 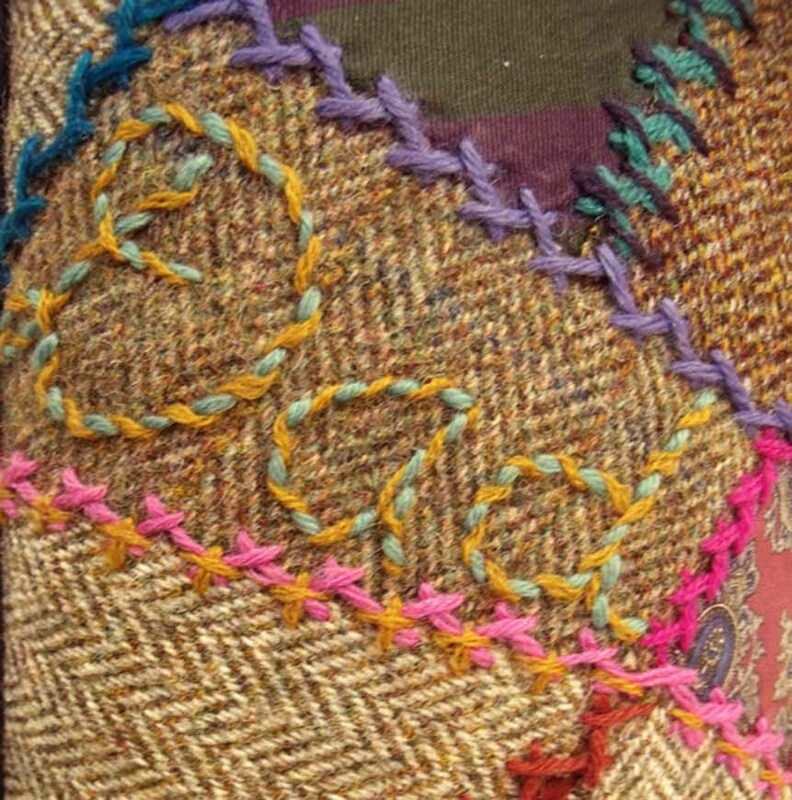 The use of the crewel yarns in the different tied herringbone stitches makes it easy to combine colours to soften and blend the brightest yarns. 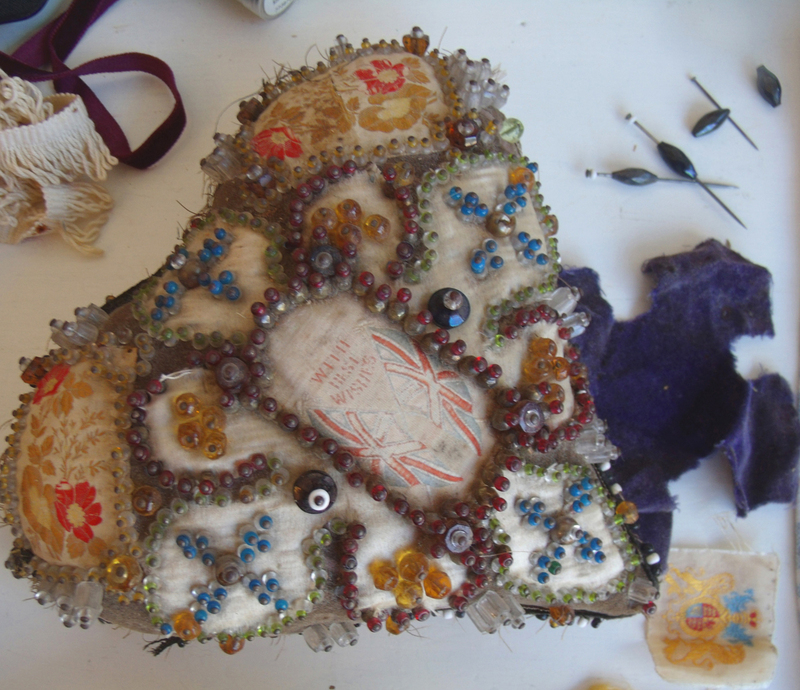 the last task before she left the studios was to machine stitch everything into place ready for the decorative stitches that are the true embroiderer’s delight in making Crazies. 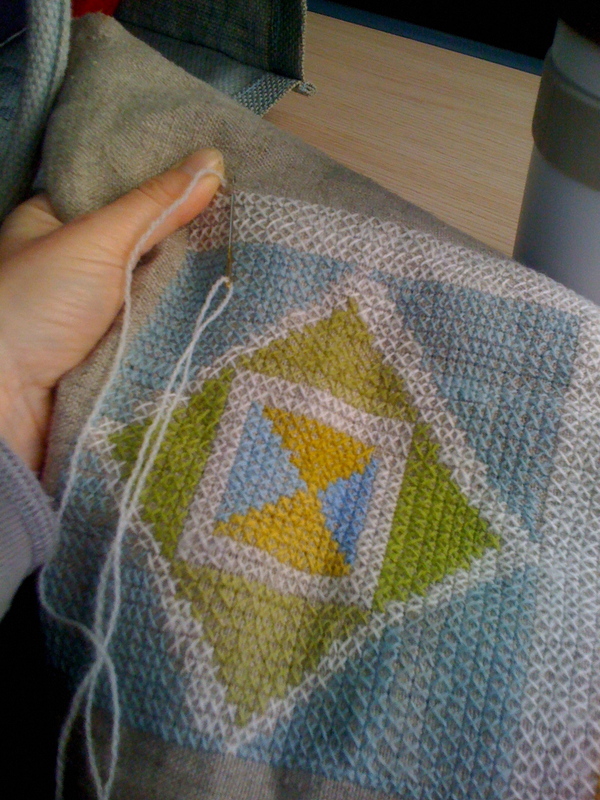 matching the patches ready for decorative stitching. 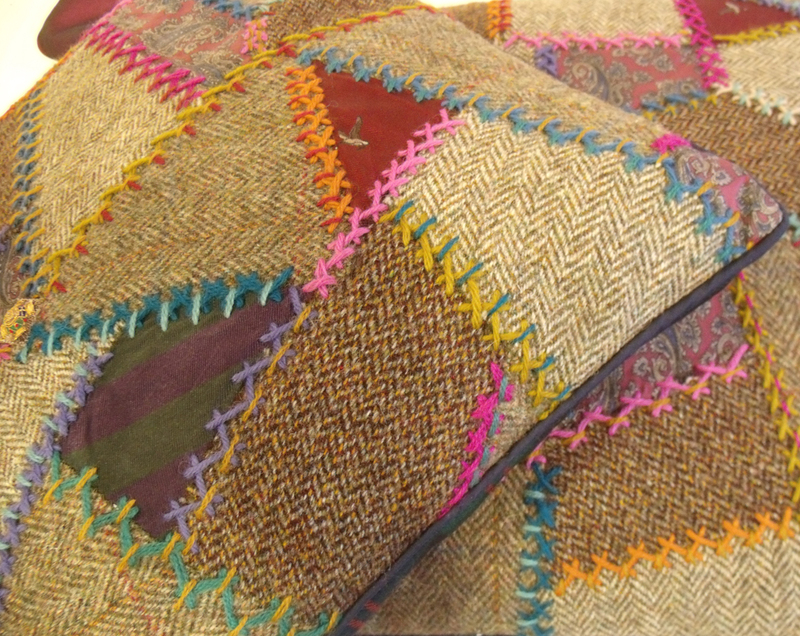 During the workshop Jane explained that she had taken tailoring lessons to make her husband a coat from some tweed he had bought from Scotland, she now wondered what she should do with it – my suggestion is to combine the left over tweeds from the jackets and use them to make a huge throw or blanket using a strippy quilt design….so she is now happy that she does not have to throw it out but most importantly, when I wrote to ask her permission to use her ‘story’ she replied that she now felt that the jackets had “still got a life”. 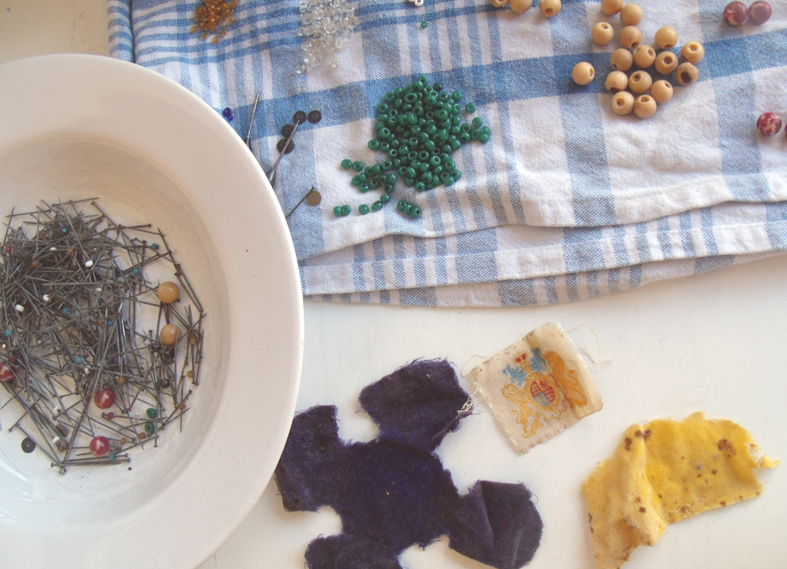 That is why I really appreciate using old and loved textiles to remake and recycle. 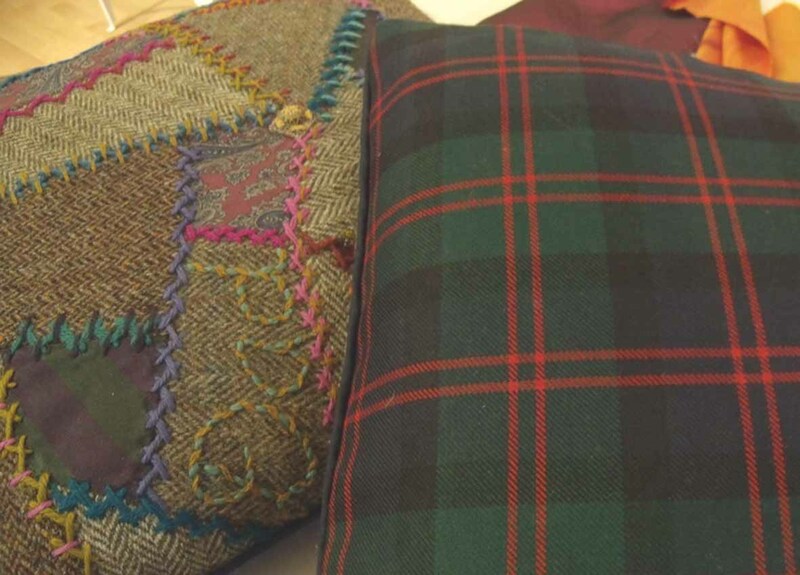 Recently I was advised to watch Kirsty Allsop’s TV programme, Hand Made Britain, in order to immediately offer a special class in whatever she had made that week in textiles; a new idea for attracting new students toHeart Space Studios. 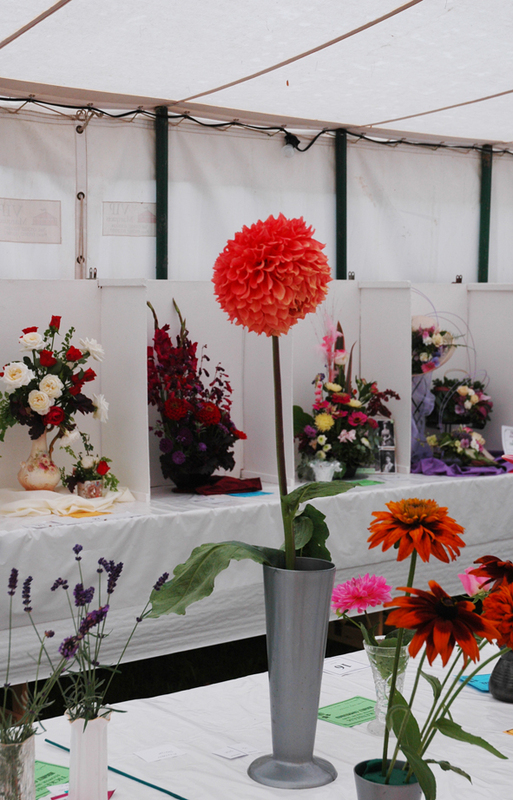 So this week I did just that – watched the programme that is all about making things for competition at County Shows, which I was delighted by having spent many happy days in marquees up and down the country gazing in amazement at the things that people produce for competition. The local Portishead flower and produce show, even inspired an entire body of hand embroidered work, The Flora Embroideries. 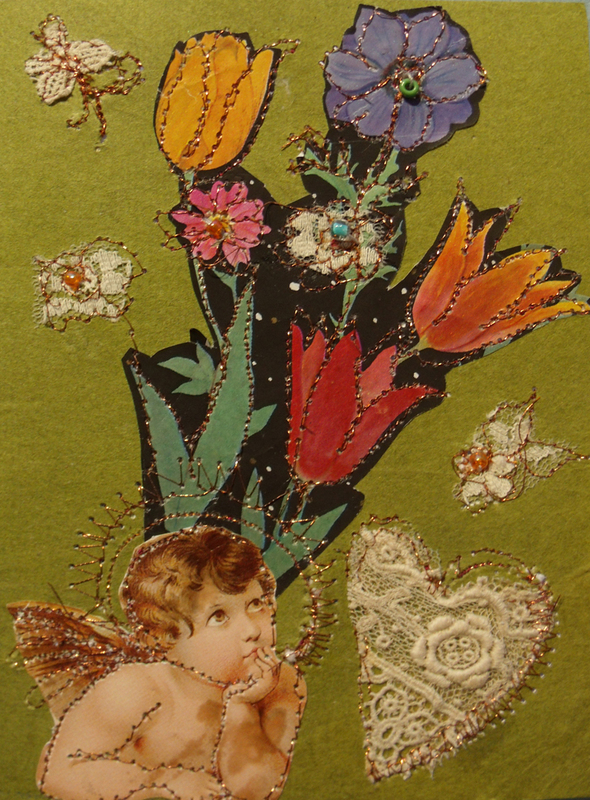 I watched with growing fascination as Kirsty, aided by textile designer Claire Coles, made a pretty paper collage that was then machine stitched to produce a greetings card with a bird and flower design. She was obviously enjoying every minute of it . That’s what I thought until I started to make my sample. 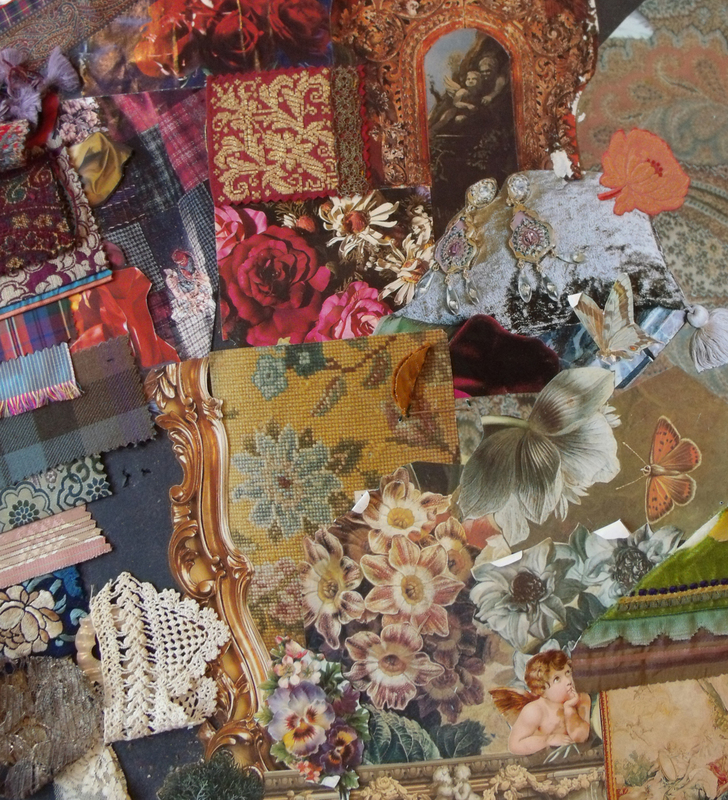 Looking in my plan chest I found some old presentation boards from my book, Crazy Patchwork, lots of lovely images and scraps of fabrics all ready to be re-cycled into new and glamorous greetings cards. 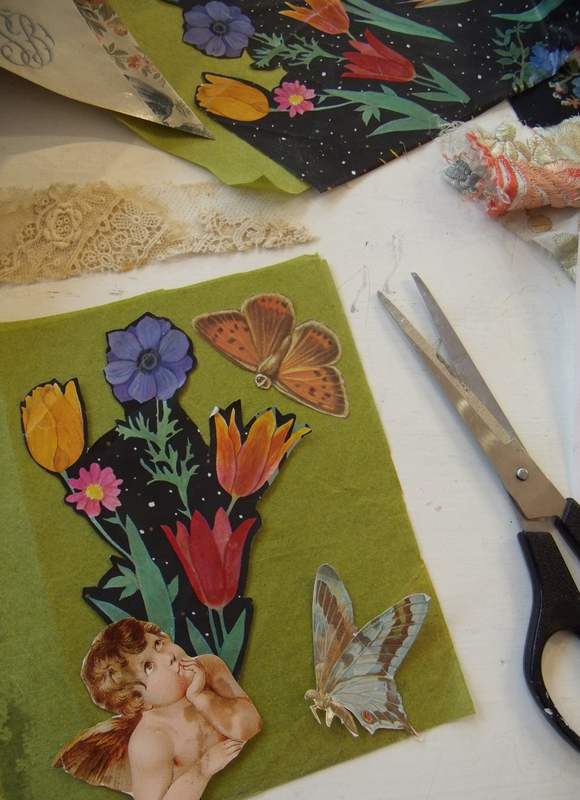 It was when I was trying to make a loose and airy design from my tiny scraps of fabrics and old flower pictures that it all seemed to go a bit wonky – but not wonky in the right way or enough to be quirky – which was the look I was aiming at. I eventually found that working on a coloured background was easier than all that white space glaring out between the collage ( I had been so busy writing my ideas down when watching the TV that I really hadn’t paid that much attention to the actual nitty-gritty of the proceedings) now I was paying the price of over confidence. I am not a great machine stitcher so even with the embroidery foot in place, the card was quite difficult to stitch in a fluid line; using metallic thread didn’t help either but I often use metallic thread as a neutral tone for busy designs, plus the scale was very small for my level of skill. 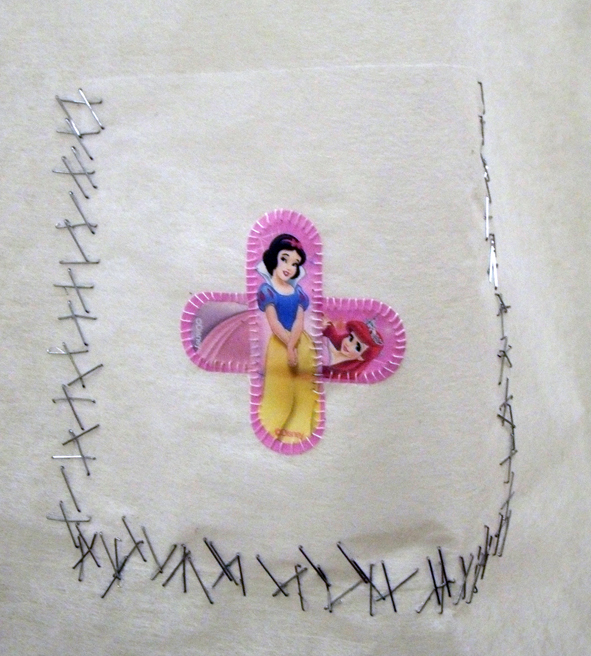 For once I actually think that I preferred the back of the card as even though the stitching is really bad – it is a quirky drawing – I may work with this idea a bit more in future. I was beginning to admire Kirsty’s effort more by the minute. 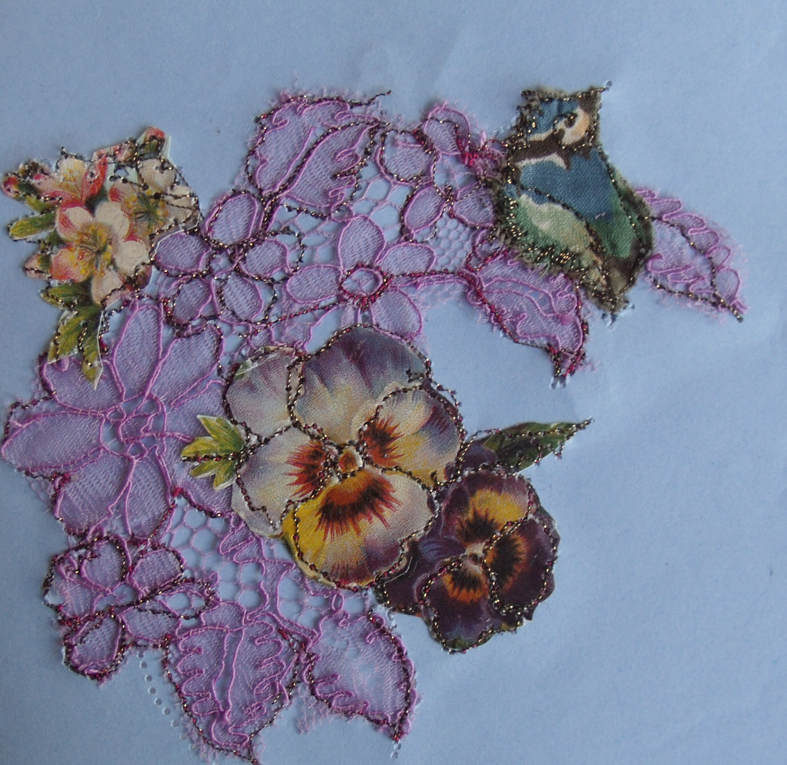 It took me about 2 hours to get to this stage, but it did look a bit sad – beads will cover a multitude of sins – like the holes in the middle of the flowers…. 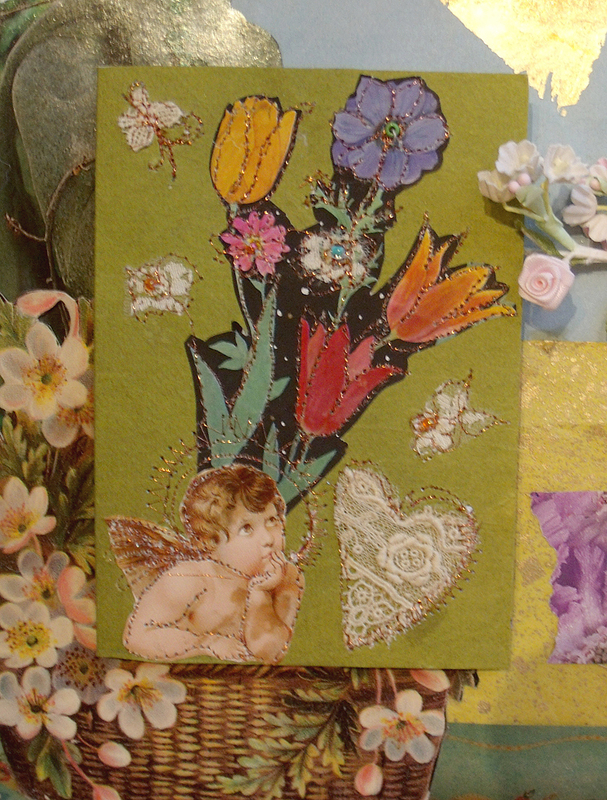 Eventually I got something I thought I could develop – I really liked the addition of lace to the paper and had to resist use all fabric instead and I like the odd combination of different materials so the next day quickly made another card to photograph for the Heart Space website to advertise the class. From these 2 samples I now need to develop a system to enable people to make their own versions simply and easily. 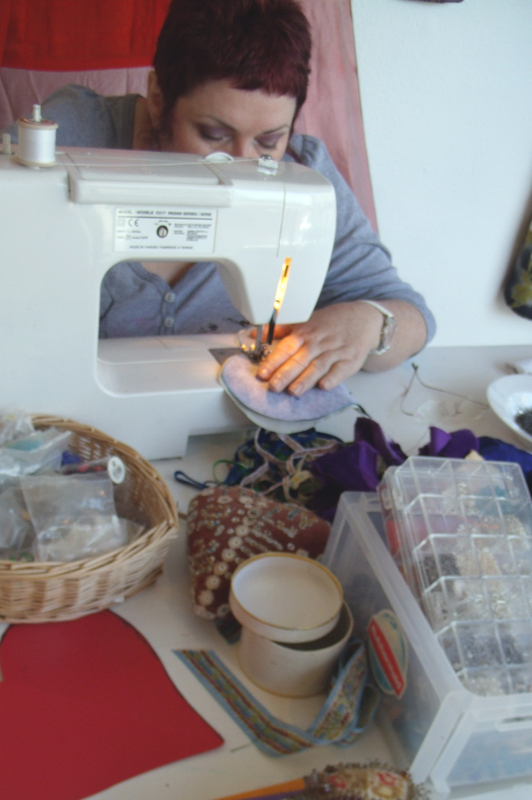 So now I am off to source and organise papers, pictures, fabrics, glues, beads, threads and cards so that the students who come here can have a relaxed and enjoyable time creating something new from something old. 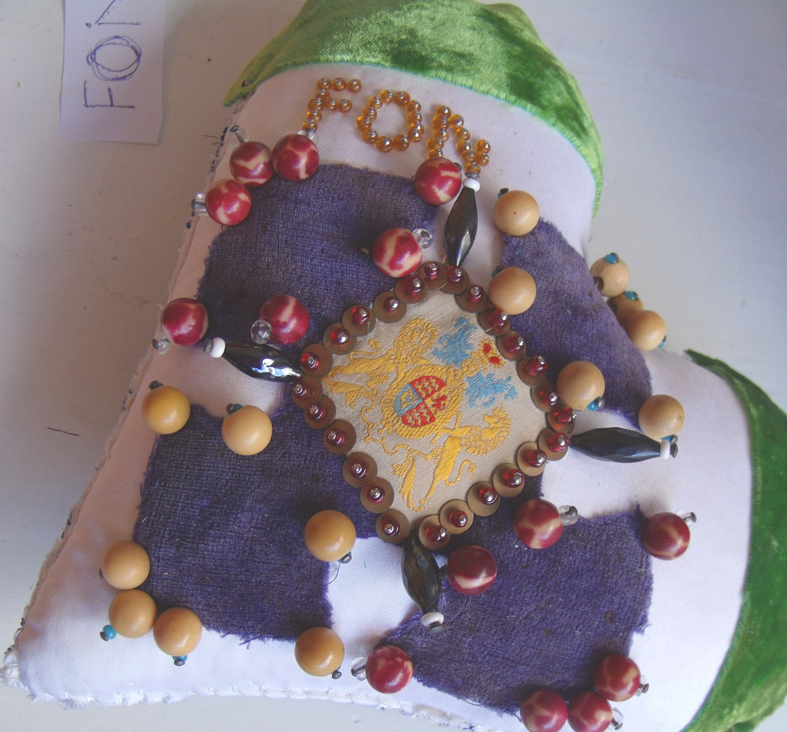 Back to Kirsty and the programme; she entered the card into an embroidery/hand craft competition at a show in Wales but won no prize with it – fair enough, it was her first attempt. 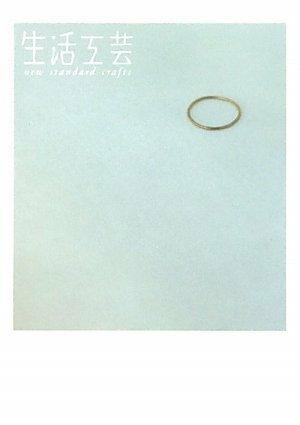 What did win was a traditional embroidery made into a card, it was very precisely stitched – in fact the prizewinner carried off the ‘best in show’ award for what looked like a large – scale cross stitched alphabet; I suspect it was made from a commercial kit or someone else’s design. For this reason, I generally find the craft displayed at most county shows dispiriting (unlike the produce which I love) all that seems to be rewarded is careful craftsmanship, but I suppose that is what the shows were originatedto promote. But I prefer to see things that people have had tried to fashion for themselves – some personal quirky things made up out of what is available which is why I always prefer seeing the children’s competitions that are often much freer in spirit, and originality is always rewarded, now what does that tell us? 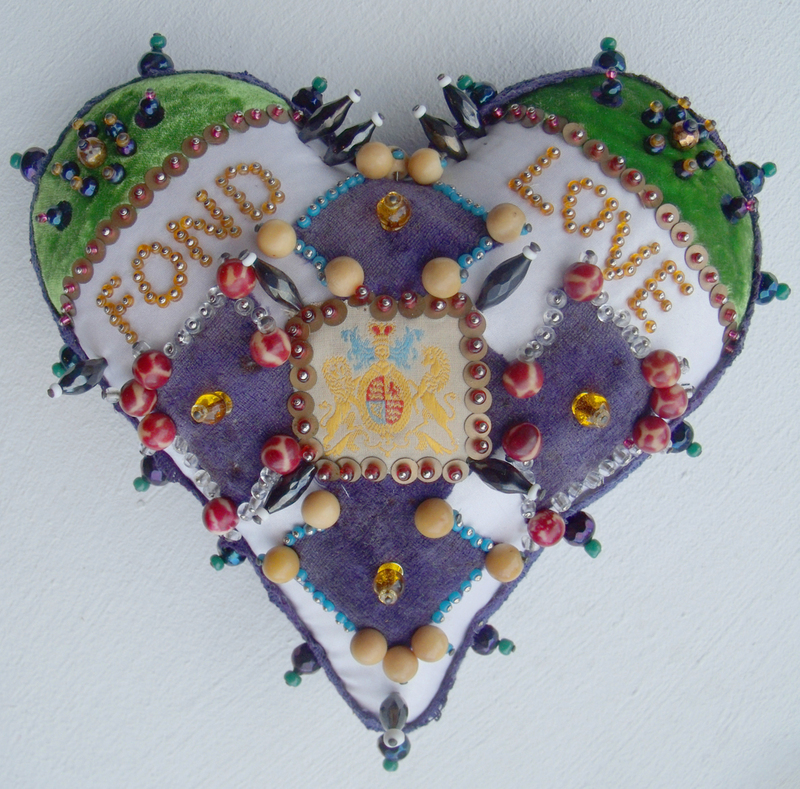 This wonderful pinned heart, so bright and fresh but curiously authentic was made yesterday during a workshop at Heart Space Studios. 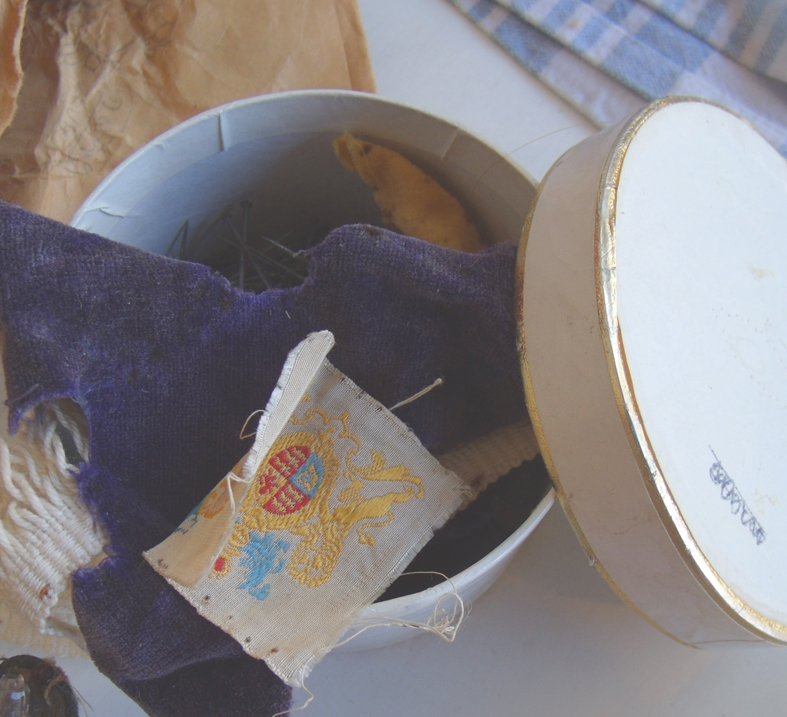 The maker, Libby, had received the original some 25 years ago from her grandmother, to whom it had been given as a token of love by her husband, a soldier, probably during the first world war. 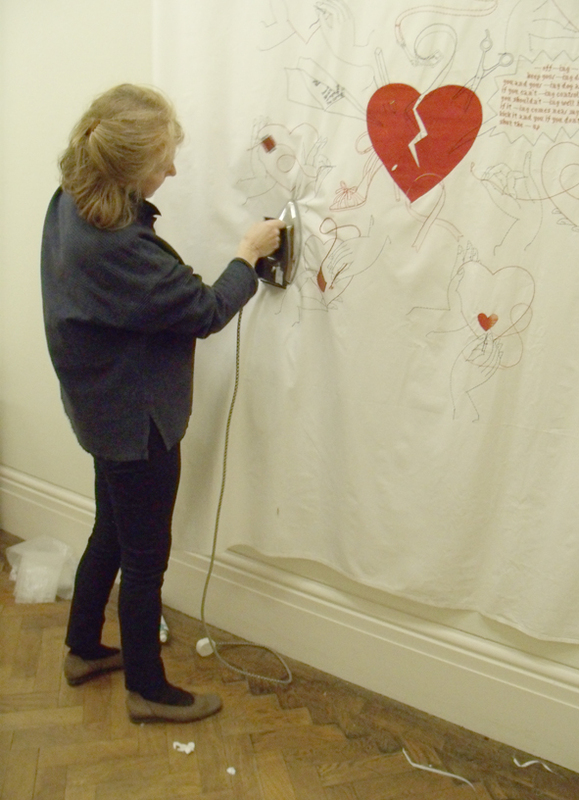 Libby re-wrote the message “FOND LOVE” onto paper and the pricked through it with a pin straight onto the silk. 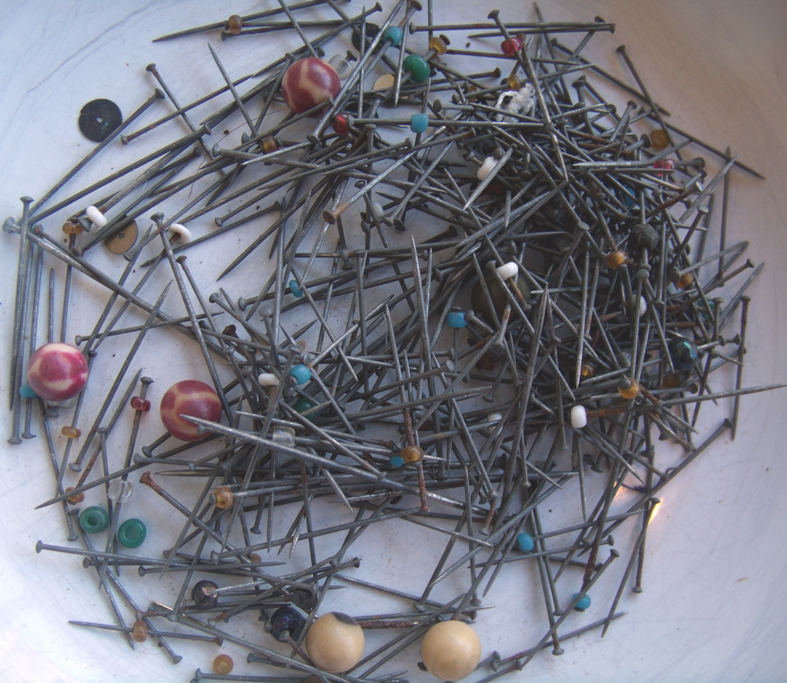 We had found some evidence of sequins in the remnants and they are useful to hide the raw edges of the applied fabrics; in my stash of beads I found some dull gold metal ones salvaged from a 1920′s dress, the same period as the original heart. Things are really moving on now at Heart Space Studios. This month we have split the whole of the front studio into an exhibition and retail space and above is the new logo I have designed for printing on the gift bags. 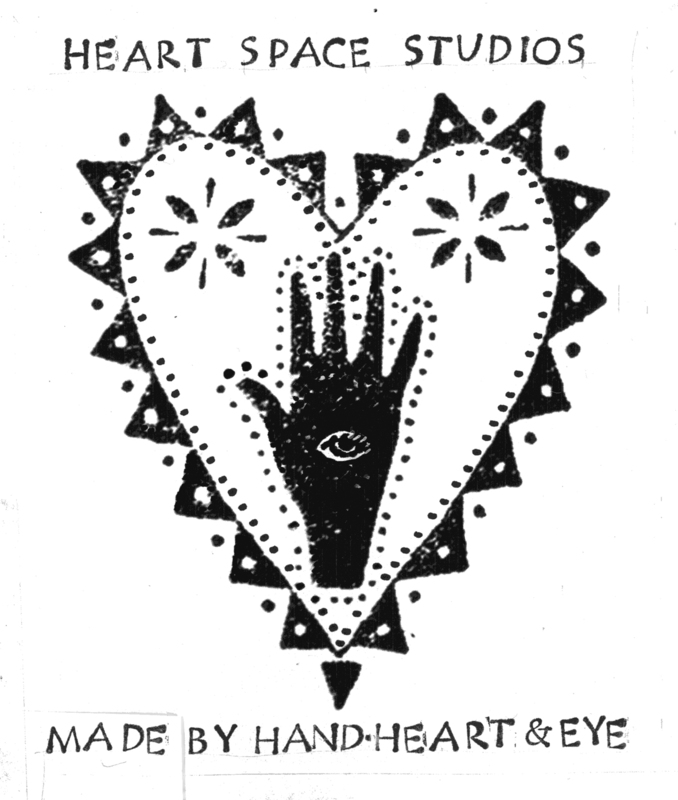 I have adapted a small rubber stamp that Teresa Searle, one of the Studios’ tutors brought for me to play with – I added the eye. 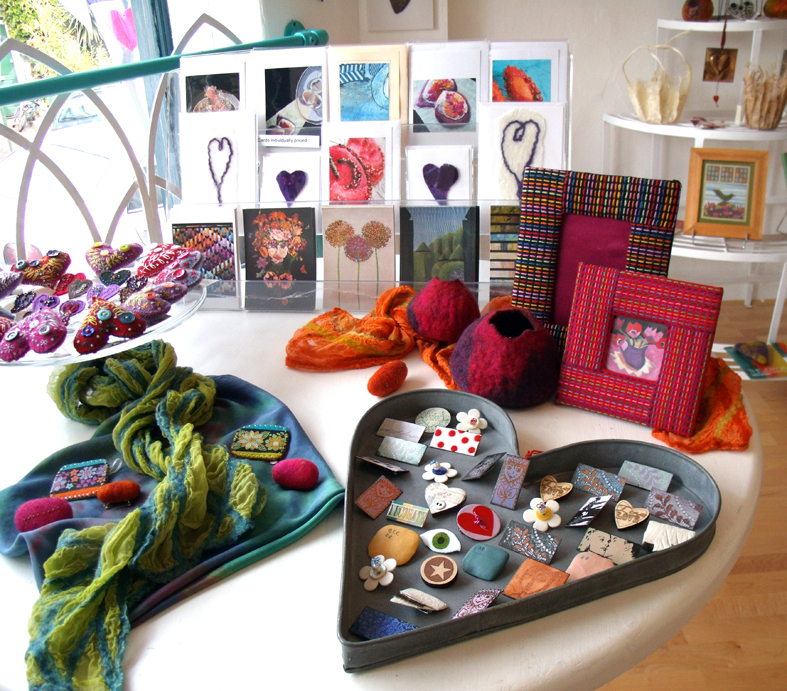 I have been helping to set up the retail space, which will sell all things textile; to begin with we will sell stuff made by the makers who work with the studios and other things that feature textile or hands, hearts and eyes imagery. I made more of the paper lanterns to sell as lots of people had asked the price when they saw the original over the dining table. 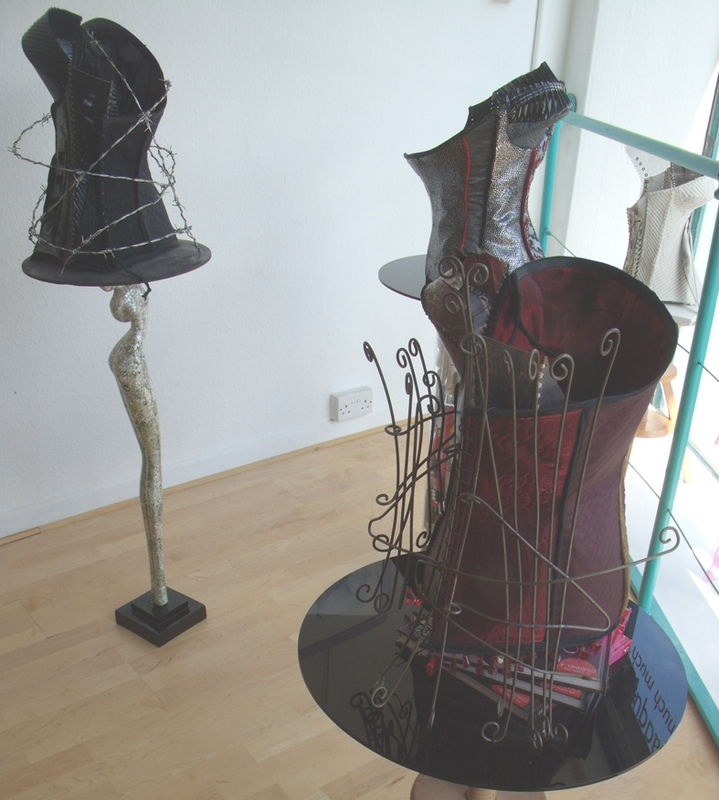 I had left the exhibition space entirely to Jan Connett and Lisa Keating to place their corsets in; each makes corsets for completely different reasons so I had imagined a compare and contrast effect. 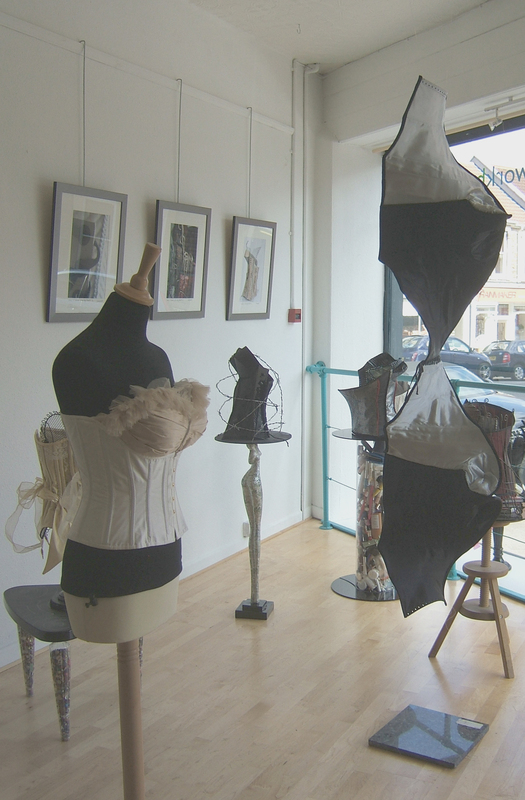 Imagine my surprise and delight when I walked in on Friday morning and this whole space was now filled with an amazing array of corsets. I had not thought that the individual pieces would work so well together. 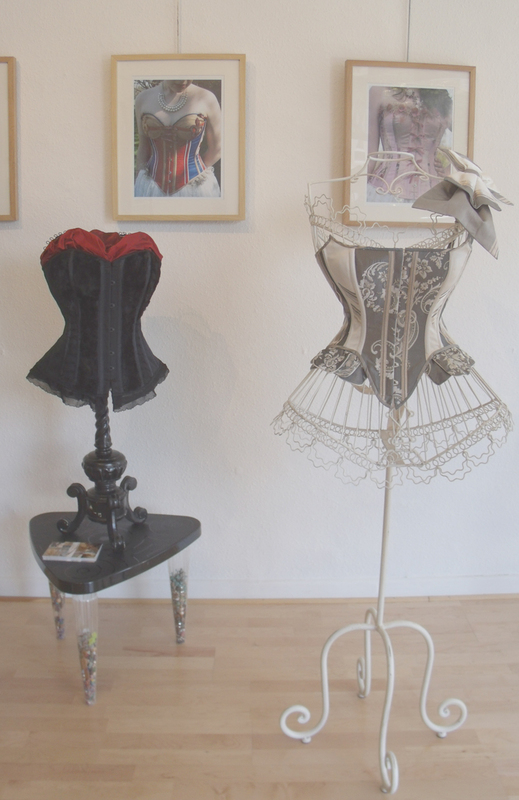 They had made a show from mounting the individual corsets onto quirky stands and the major colours were cream and black and red. Lisa’s traditional corsets made with silk and lace and net were the perfect partner for Jan’s barbed wire and metal and leathers. 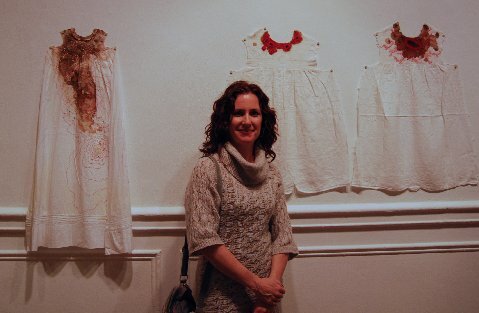 Lisa Keating’s lace and chiffon and fur confections. Meanwhile on the other side of the room the retail space was taking shape…. 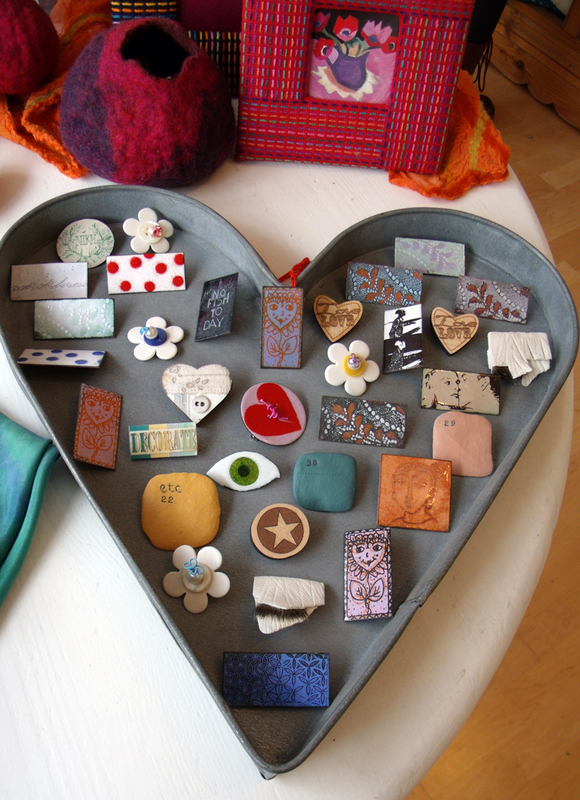 a selection of my enamel heart stone badges and brooches all together in the large show case…. 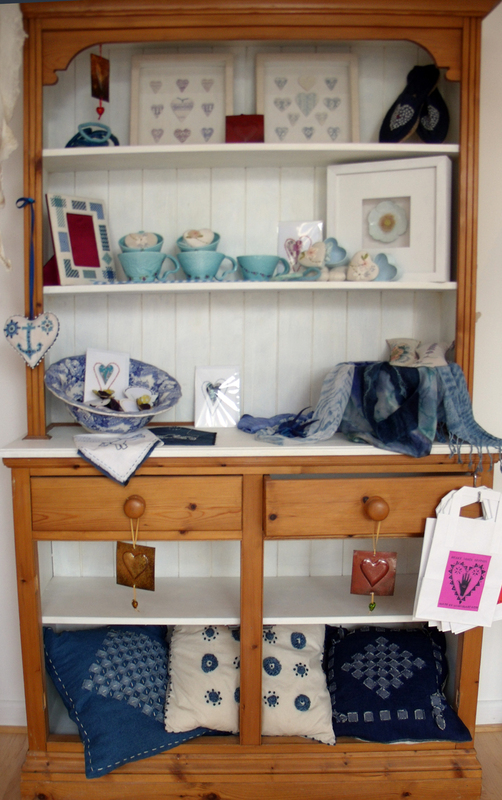 and then in the dresser there is a blue and white theme…. 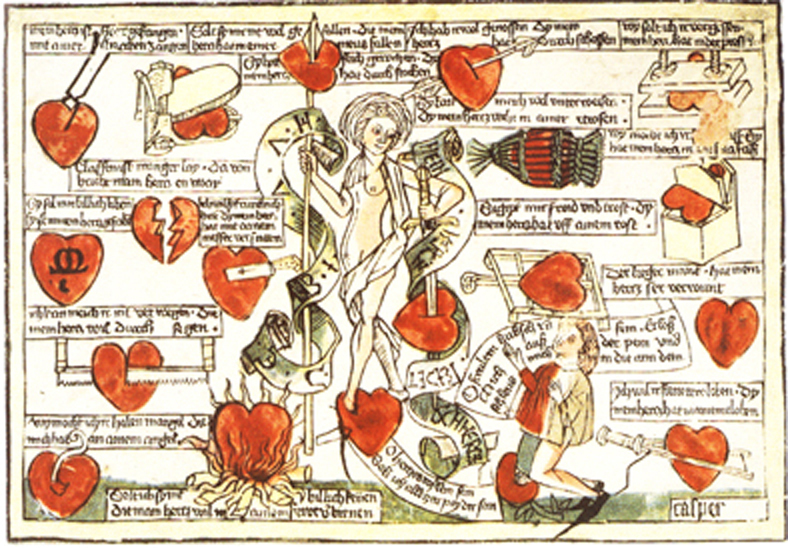 and on the old round table more and more hearts….. 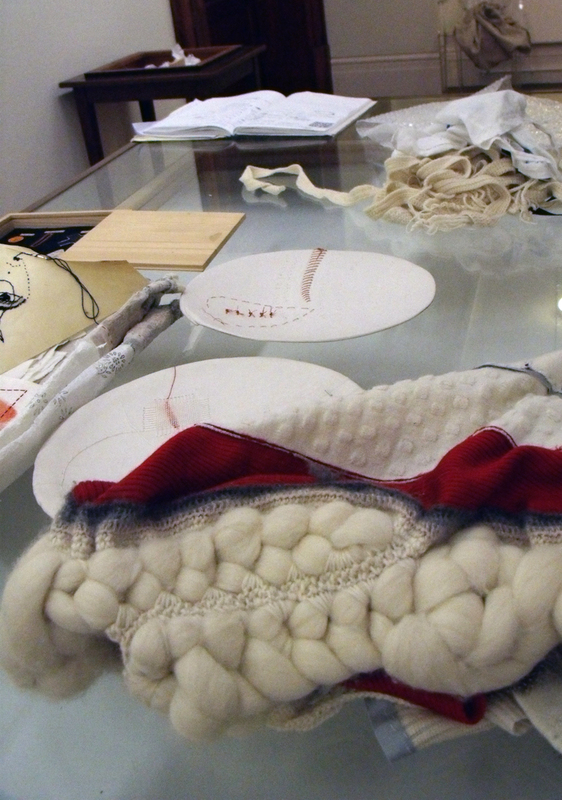 I know that many people feel that all these textile pieces won’t work together – you can’t mix art with craft, gallery with shop, colour with monotone.. I have always thought this a nonsense when it comes to the wealth of textile treatments and qualities, let’s embrace the difference, the vitality and the fact that the same person who makes a silk embroidery of a mended and broken heart can delight in making a ribbon flowered box and woman who makes a barbed wire corset to set out her arguments about control and pain can put together charming cards featuring stitched fruit and flowers – all to be seen and Sold at Heart Space Studios. I am moving away from a studio based practise like painting or printing towards a practise where I can work with people. 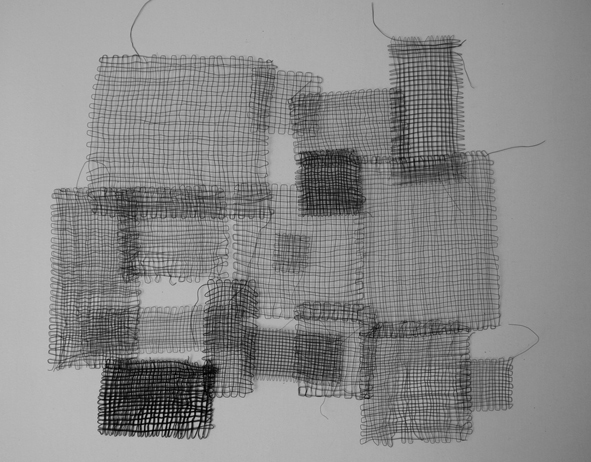 but since I have started to research for my dissertation about participation and textile, it has become more clear for me, that I see myself rather in taking part in collaborative projects or initiating my own projects. 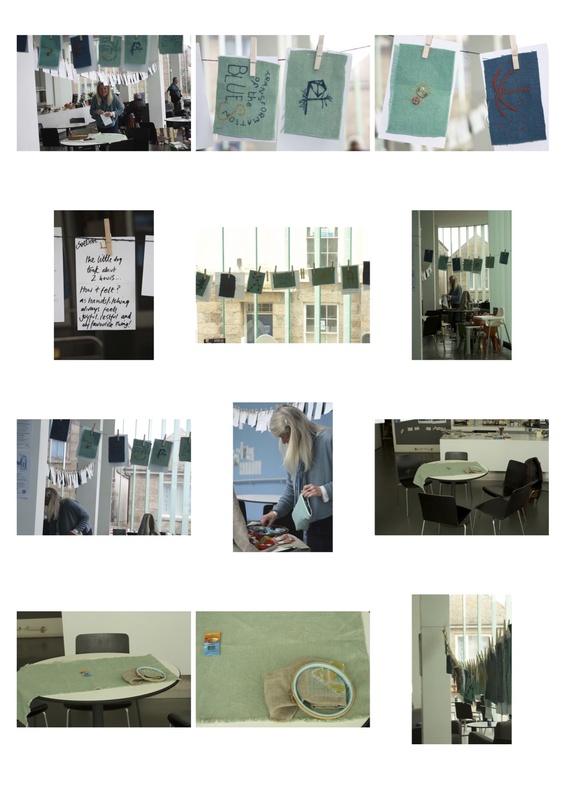 Mark Leahy introduced me to the Even Feed project, which was curated by Gareth Ballyn. Even Feed commemorated Issac Singer’s ( as in Singer, the sewing machine) 200 year birthday. individual people and to groups took part: the brief was to create a piece of clothing from simple nature cotton fabric. 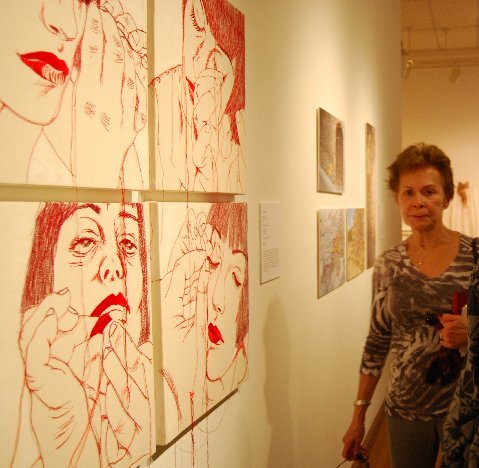 the art work was the whole project, the time they spend together sewing and sharing their stories, not the exhibition at the end of it. this is a kind of work I feel at home with. 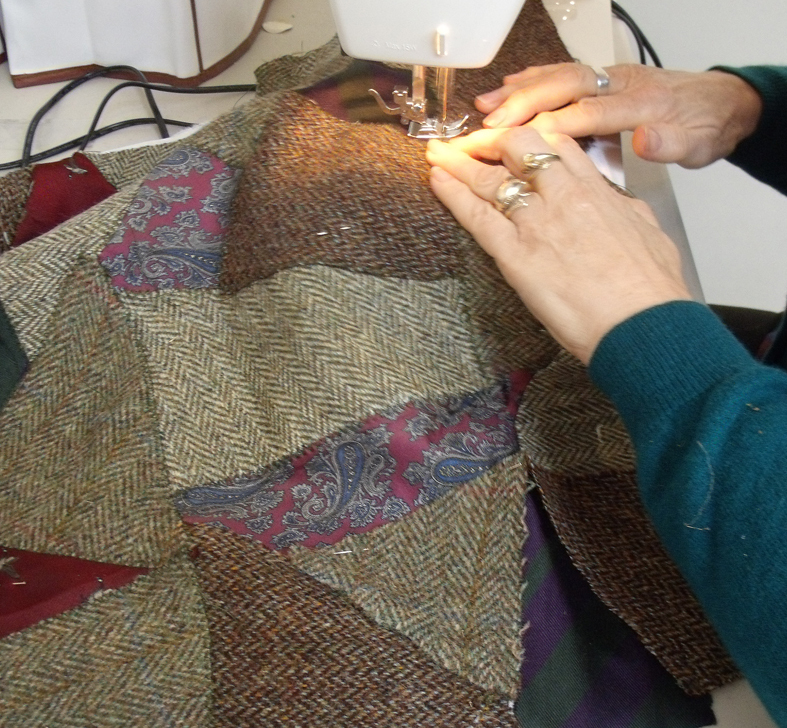 Mark , who took part in this project, sewed a jacket his mother had sewn for his father 50 years ago. he still had the original pattern and the recite for the material. MARK LEAHY is a writer, artist, teacher, and project manager operating among textual practices, performance, and live and installed arts.